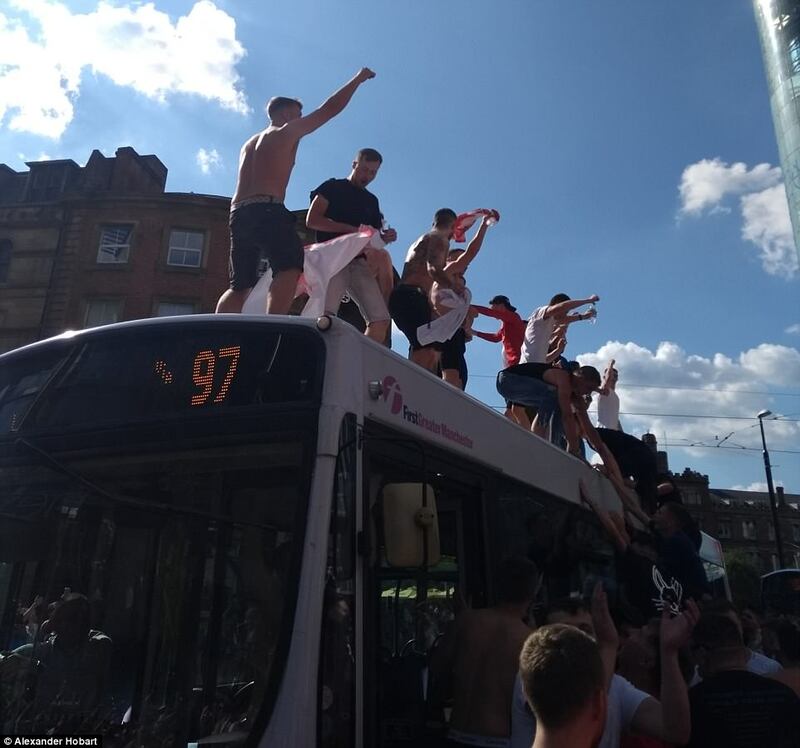 England celebrating world cup glory, in advance! 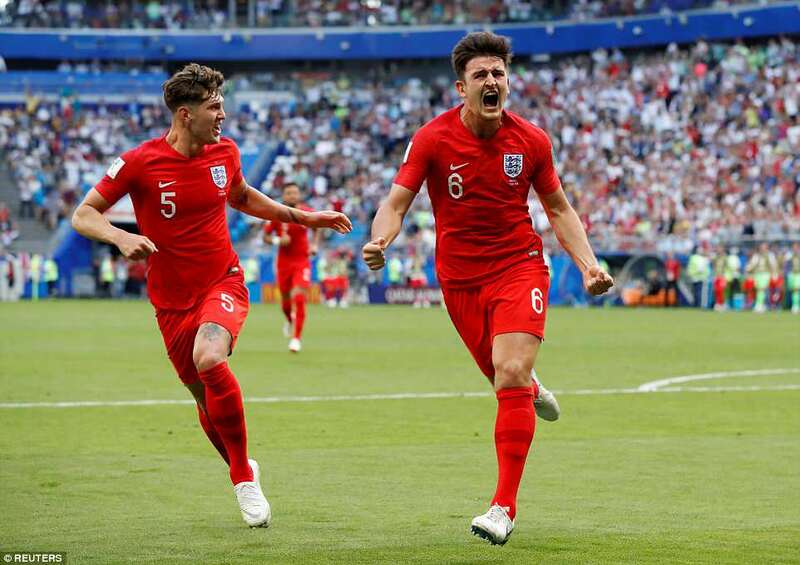 England are through to the semi-finals of the World Cup for the first time in nearly three decades after a triumphant 2-0 win over Sweden. 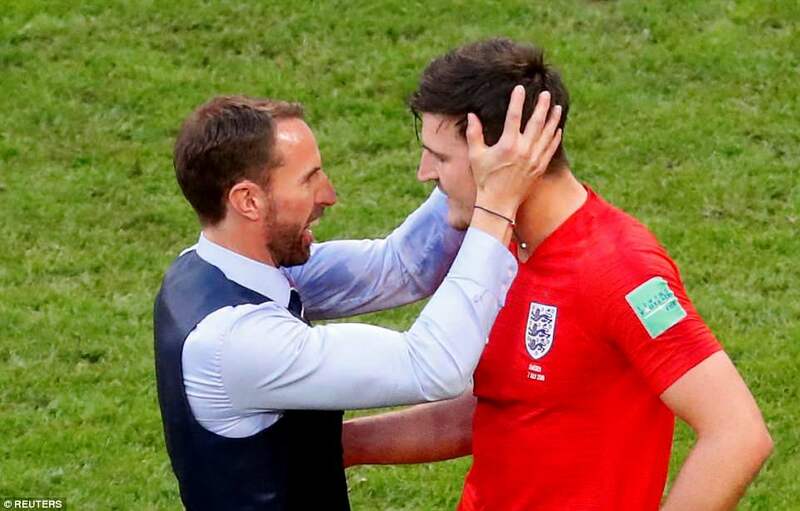 The Three Lions took first blood in the fixture courtesy of Harry Maguire, rising highest on the half hour mark to meet an Ashley Young corner and send the ball crashing into the back of the net. 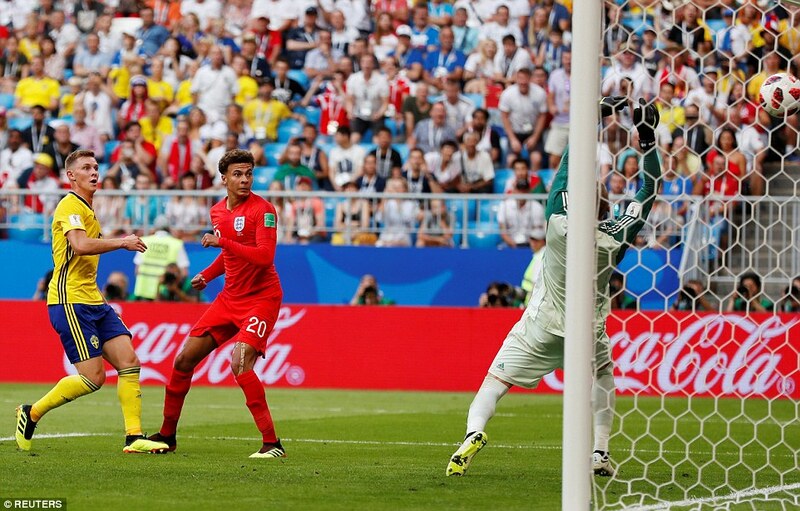 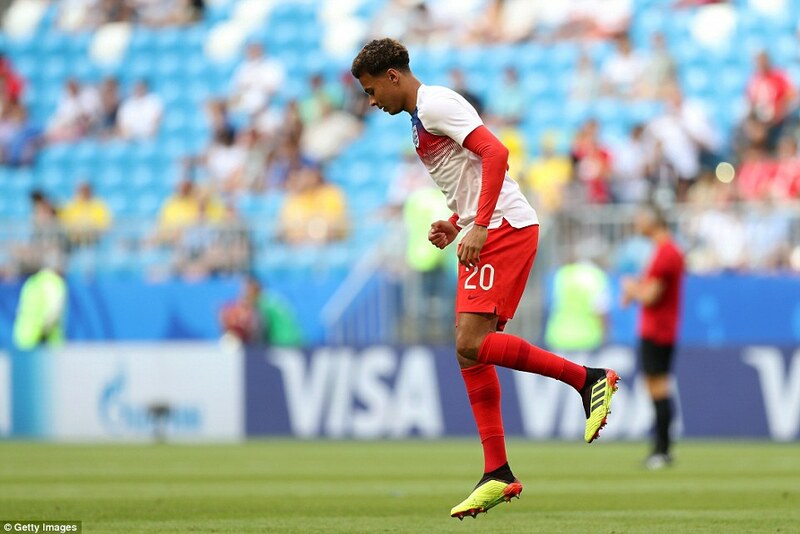 After surviving an early scare in the second half England soon had their second, with Dele Alli heading home Jesse Lingard’s first-time, curling cross. 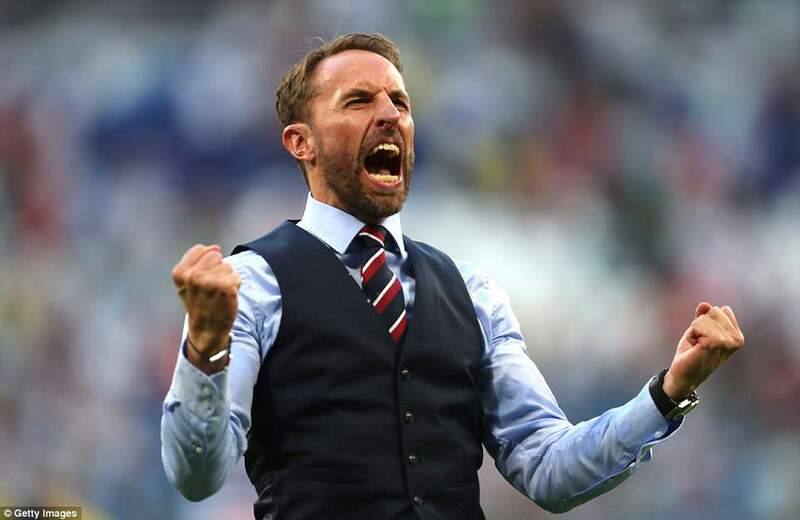 Gareth Southgate and his men will now take on the winner of Croatia and Russia on Wednesday at 7pm. 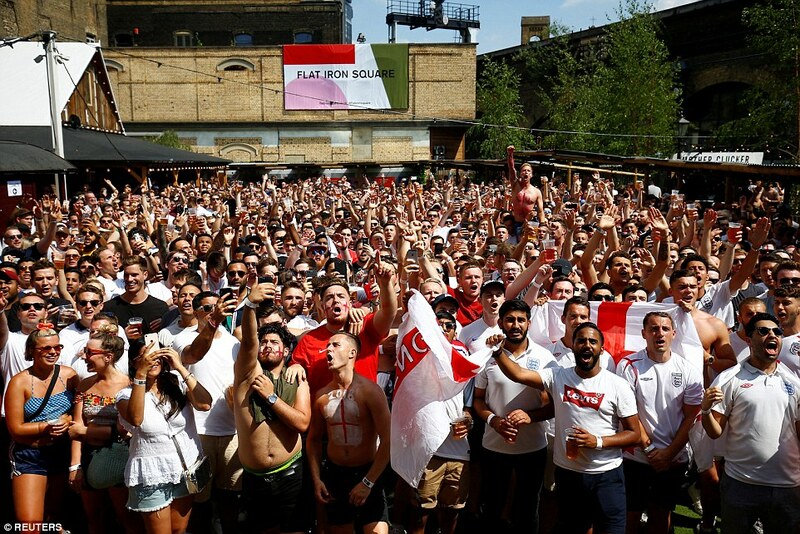 The win sent shockwaves through the UK as 32 million England fans exploded with joy after watching the Three Lions make it through to the semi-final of a World Cup for the first time since 1990. 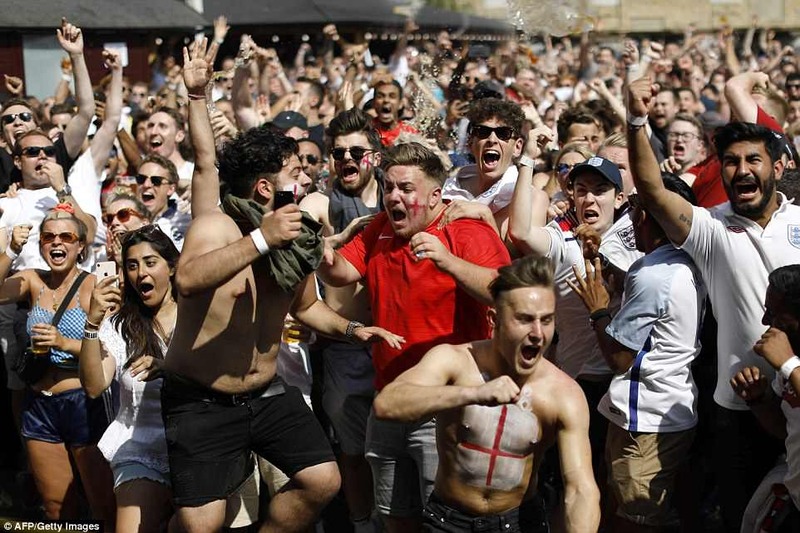 Beers were thrown, shirts ripped off and flags waved as jubilant fans went wild when the final whistle was blown and England’s fate was sealed. 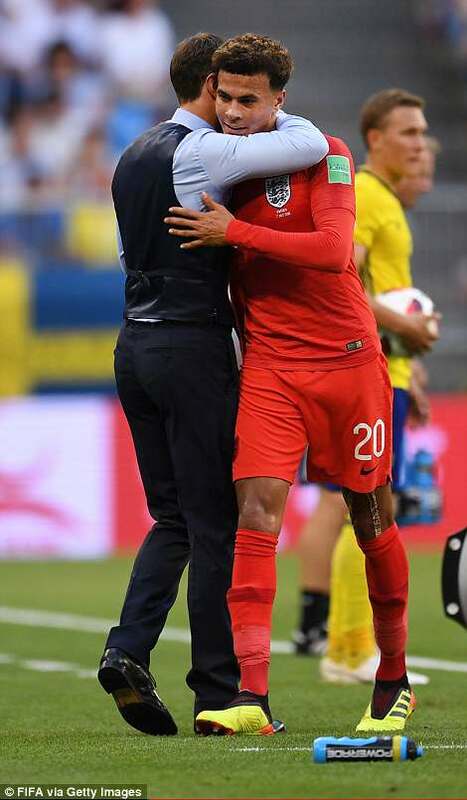 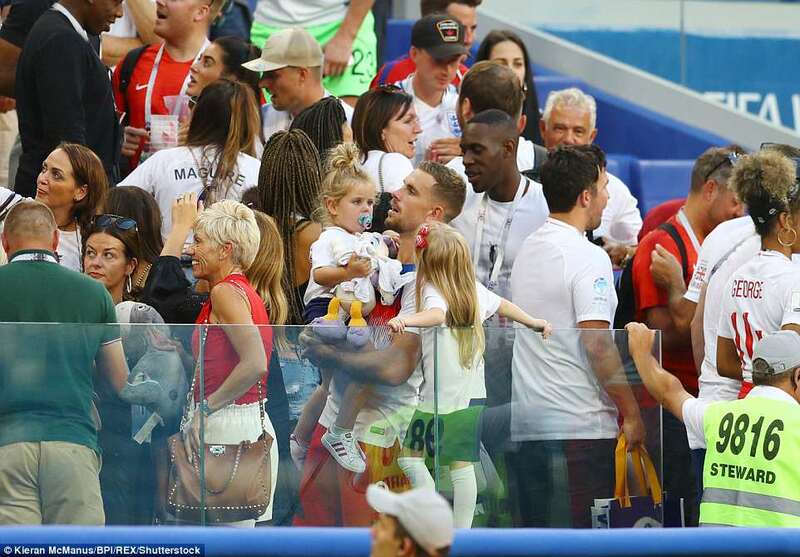 Defender Kieran Trippier – who has created 12 chances for England this World Cup – was praised by his father Chris after the final whistle. 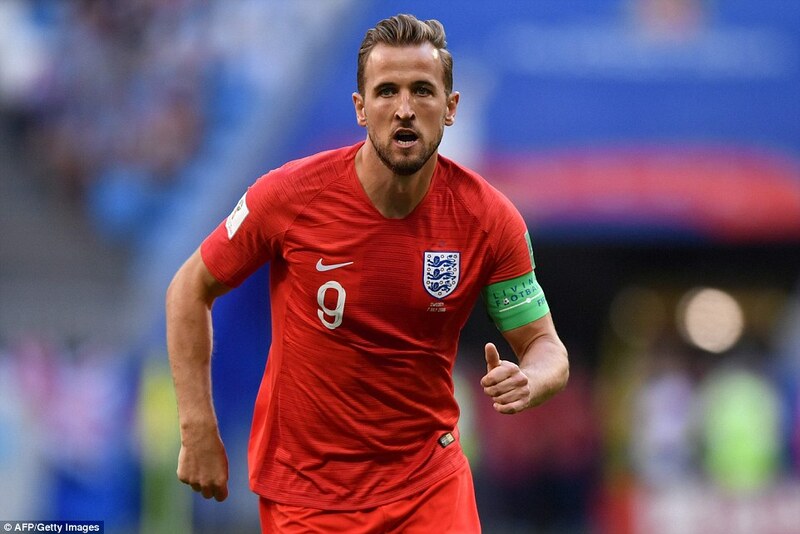 Kensington Palace congratulated the team on its most successful World Cup in almost three decades, telling Harry Kane’s squad they are ‘making history’ and echoing chants of ‘football’s coming home’ heard across the country this afternoon. 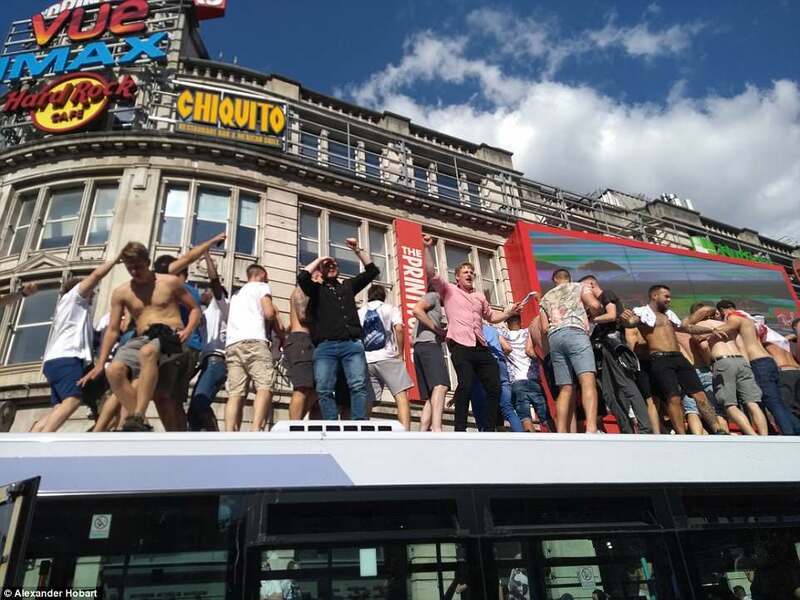 It came after The Bands of the Guards Division played a version of ‘Three Lions – It’s Coming Home’ on the forecourt of Buckingham Palace yesterday. 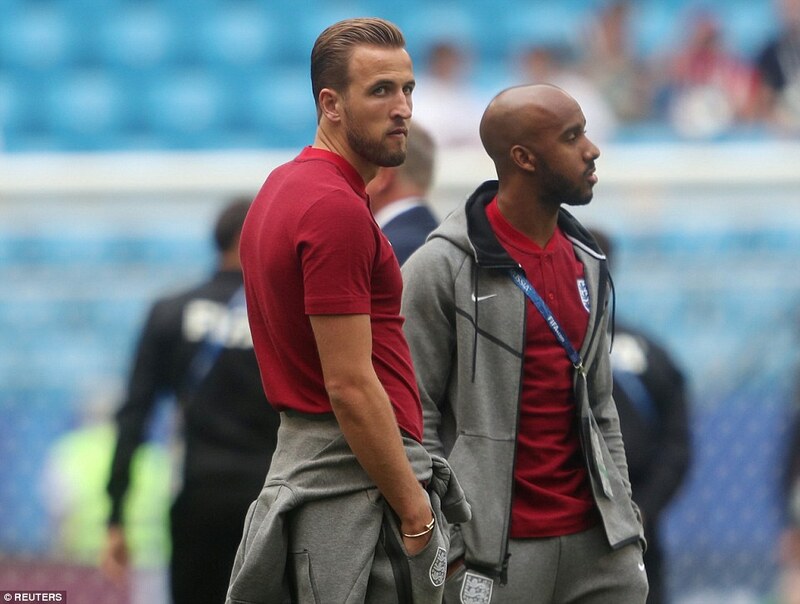 The skipper (pictured beside Fabian Delph) had his game-face on just an hour before kick off. 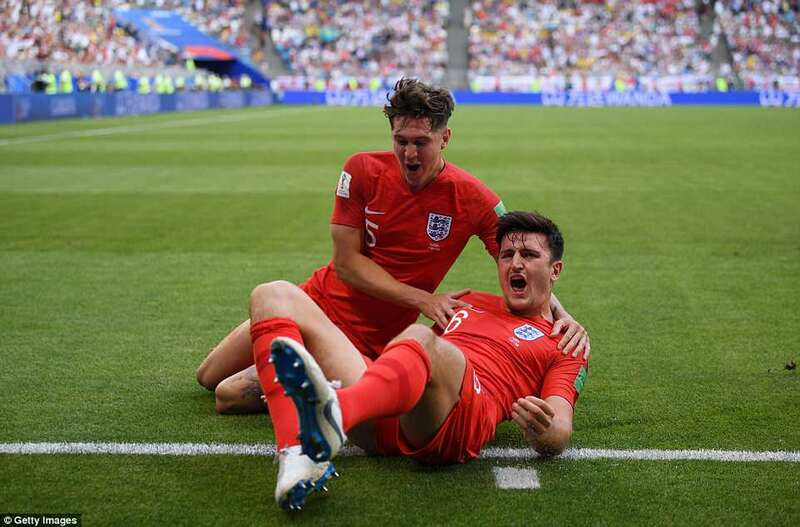 It was Maguire’s first international goal, and England’s 10th of the tournament. 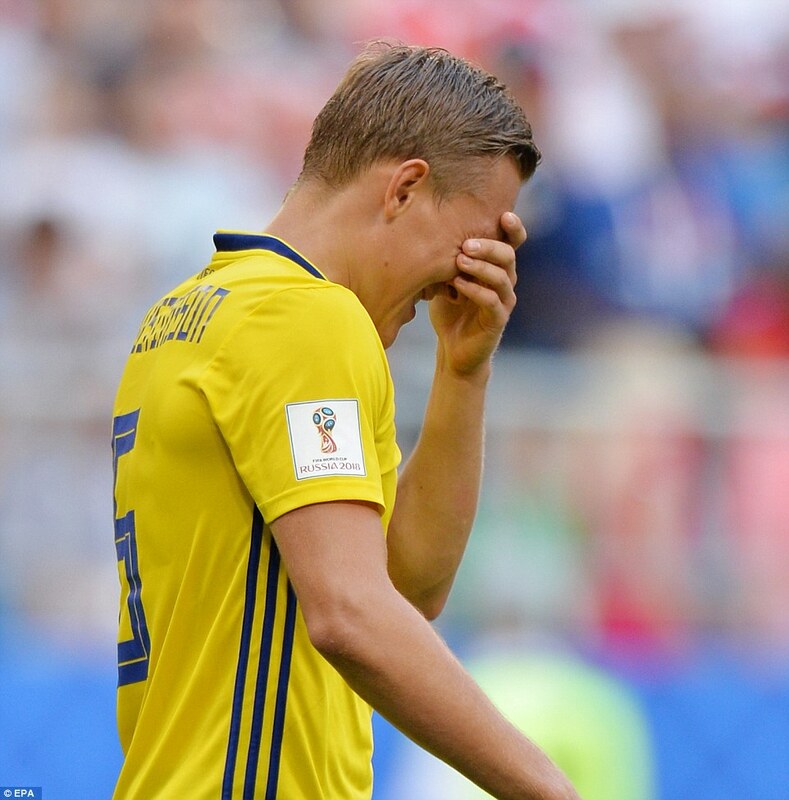 SWEDEN: Olsen, Krafth, Lindelof, Granqvist, Augustinsson,Claesson, Larsson, Ekdal, Forsberg, Berg, Toivonen. 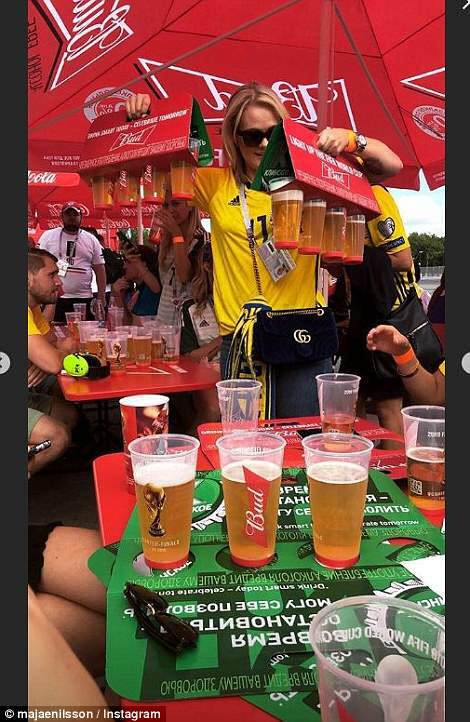 SUBS: Johnsson, Olsson, Guidetti, Svensson, Helander, Hiljemark, Jansson, Rohden, Durmaz, Thelin, Nordfeldt. 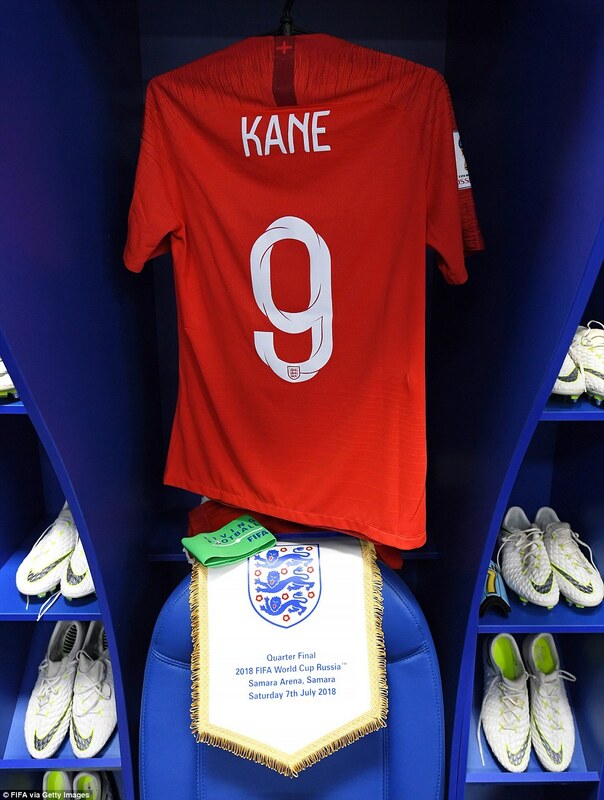 ENGLAND: Pickford, Walker, Stones, Maguire, Trippier, Alli, Henderson, Lingard, Young, Sterling, Kane. 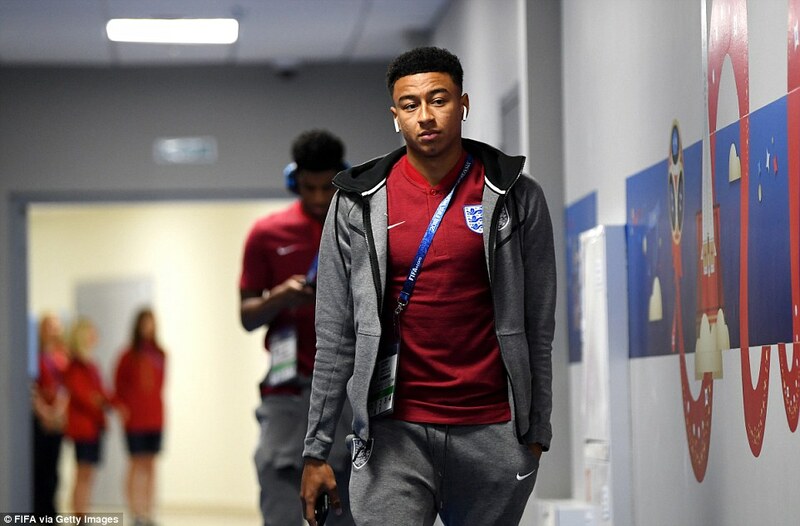 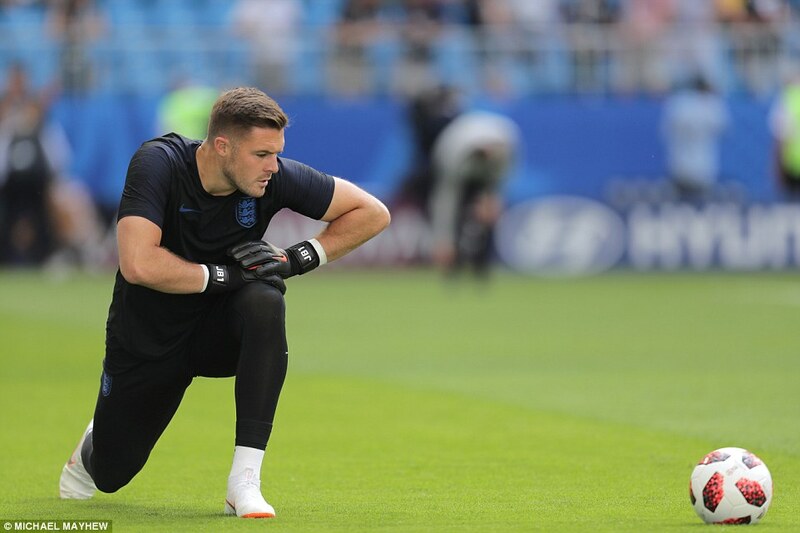 SUBS: Butland, Rose, Dier, Vardy, Welbeck, Cahill, Jones, Delph, Rashford, Loftus-Cheek, Alexander-Arnold, Pope. 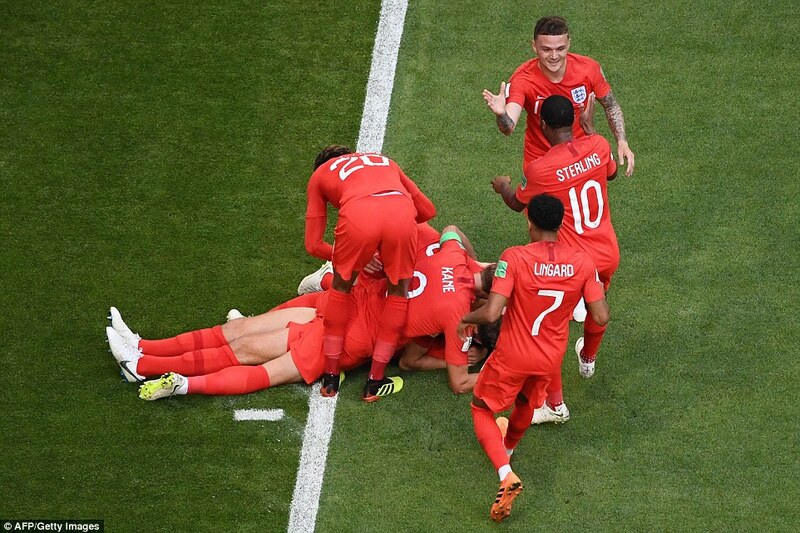 It was England’s 11th goal in Russia, equaling the national record of 11 goals scored on the run to the World Cup title in 1966. 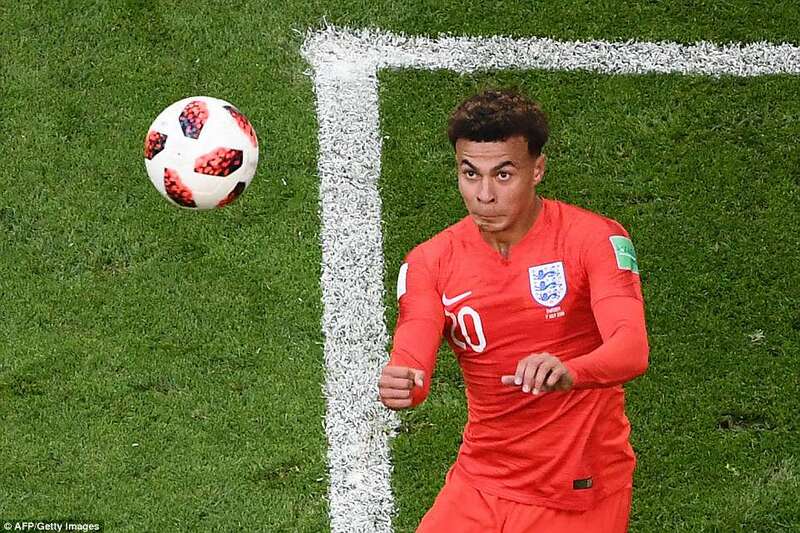 England will go into the semifinals against the winner of Saturday’s later match between Russia and Croatia in Sochi. 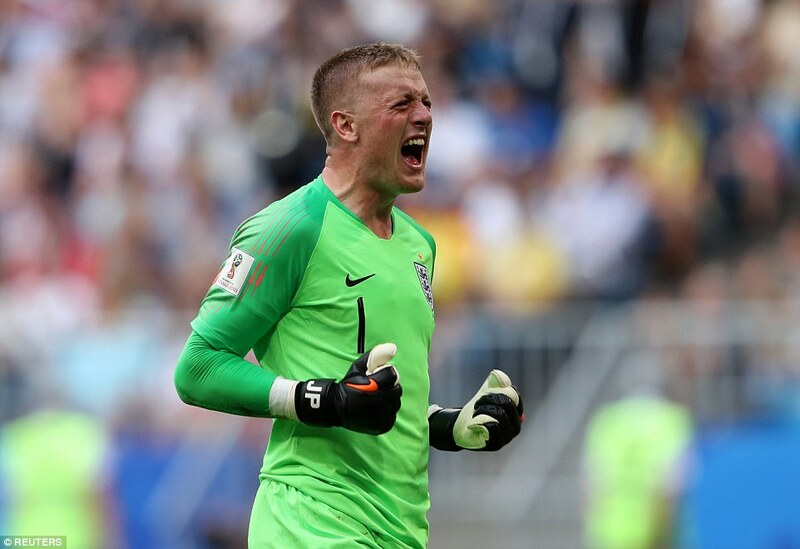 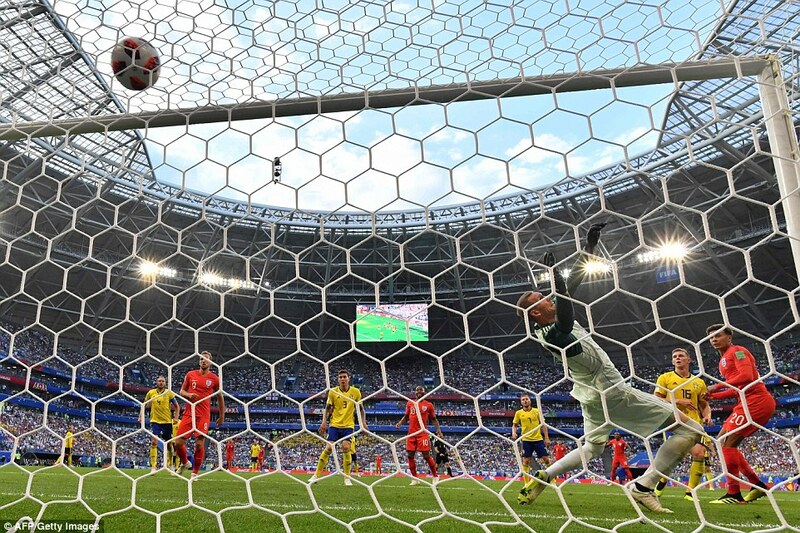 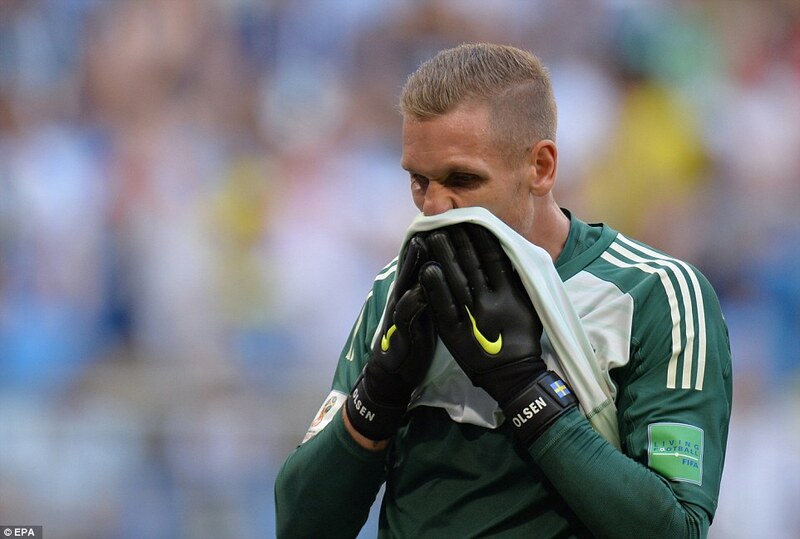 Sweden had their best chance two minutes into the second half with a Marcus Berg header, but England goalkeeper Jordan Pickford pushed it out of harm’s way. 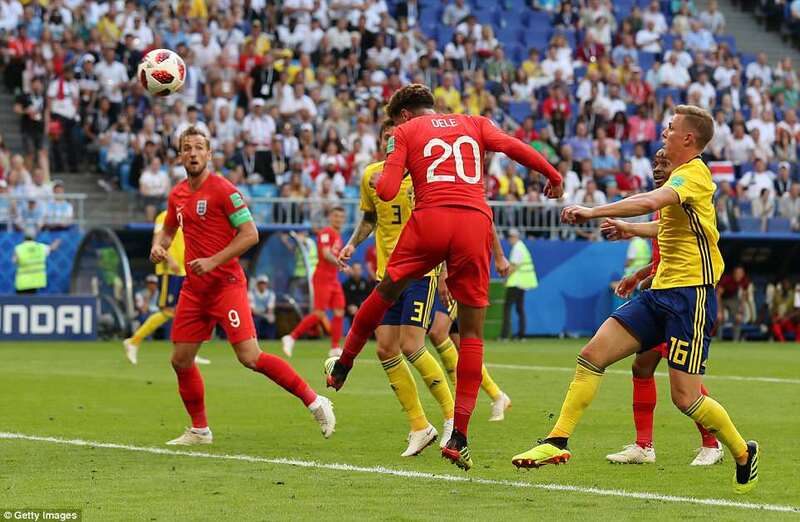 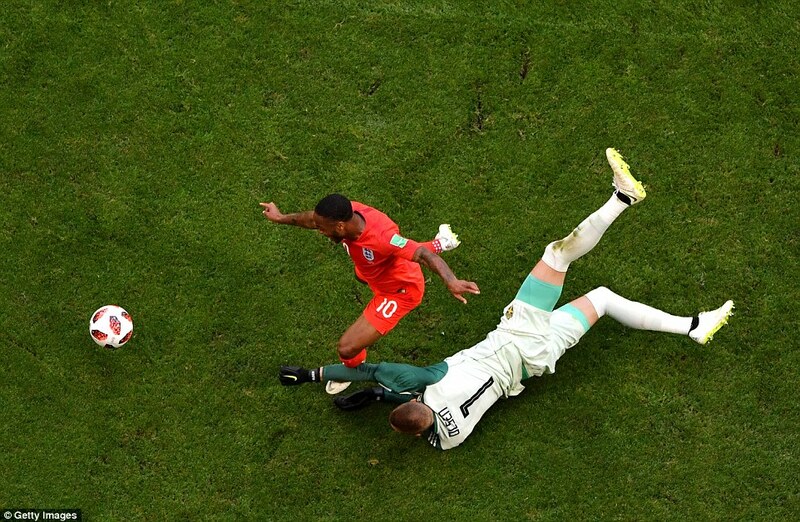 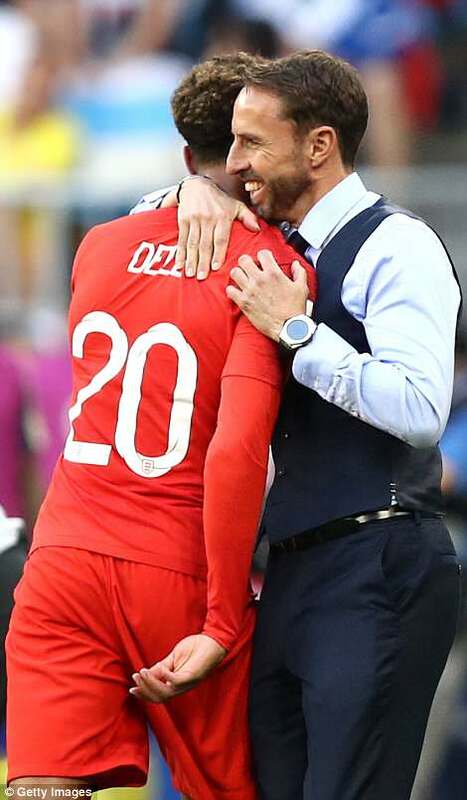 After a long, patient build-up Sterling finally took England inside the box and appealed for handball when his chipped pass hit Emil Forsberg. 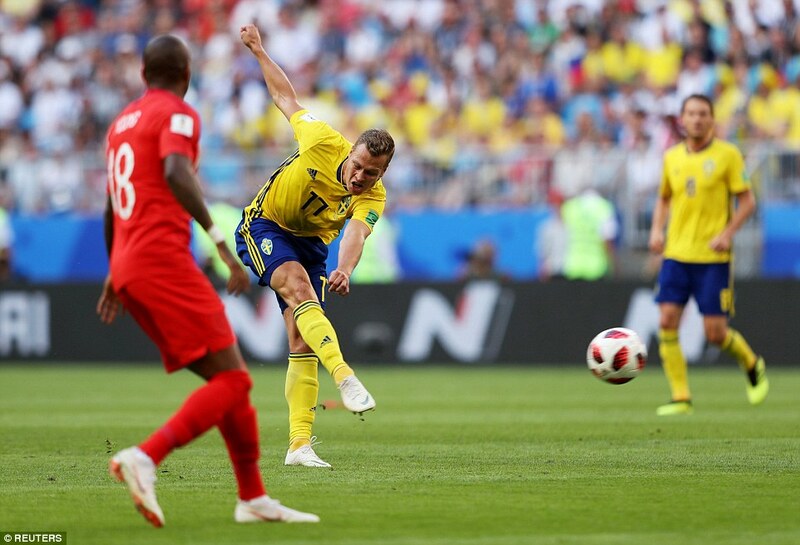 Space opened up in front of Claesson again on the quarter-hour but his ball into the box came off Henderson and allowed Harry Maguire to clear. 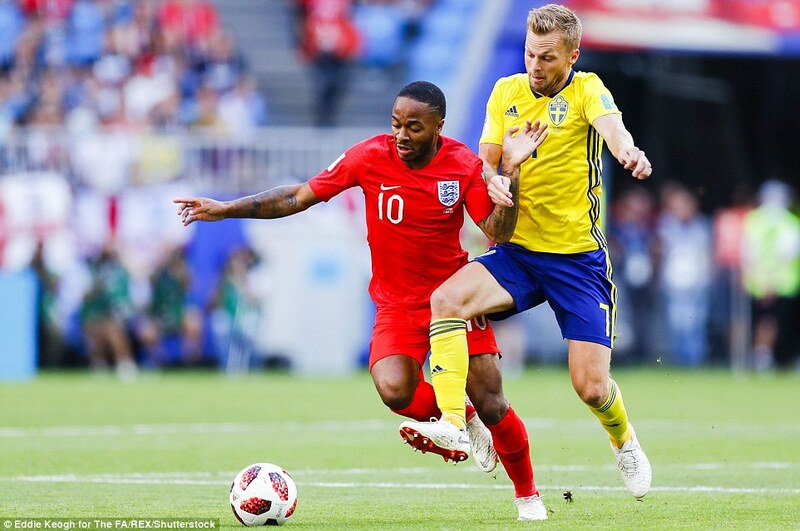 In the 19th minute England finally broke with some speed, Henderson cleverly shuttling the ball forward for the dashing Sterling. 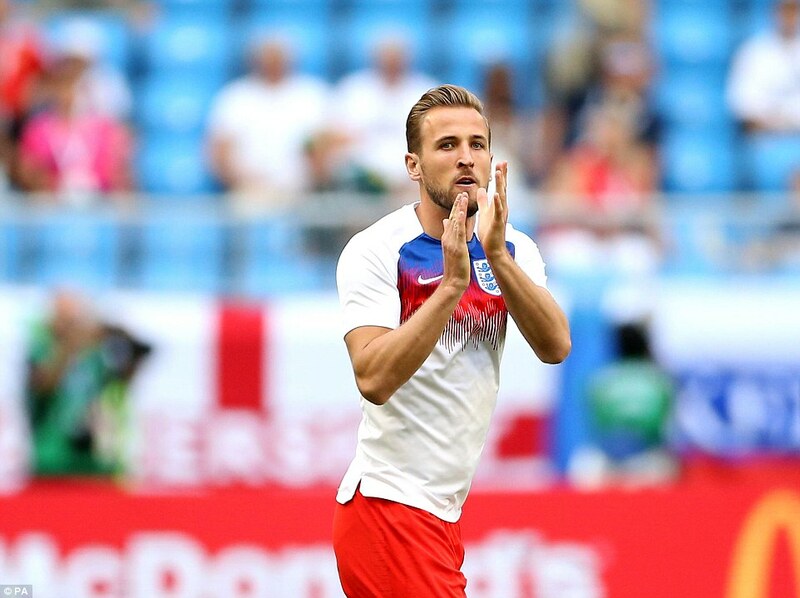 The Manchester City winger made good progress upfield and stepped aside when his run brought him alongside Kane. 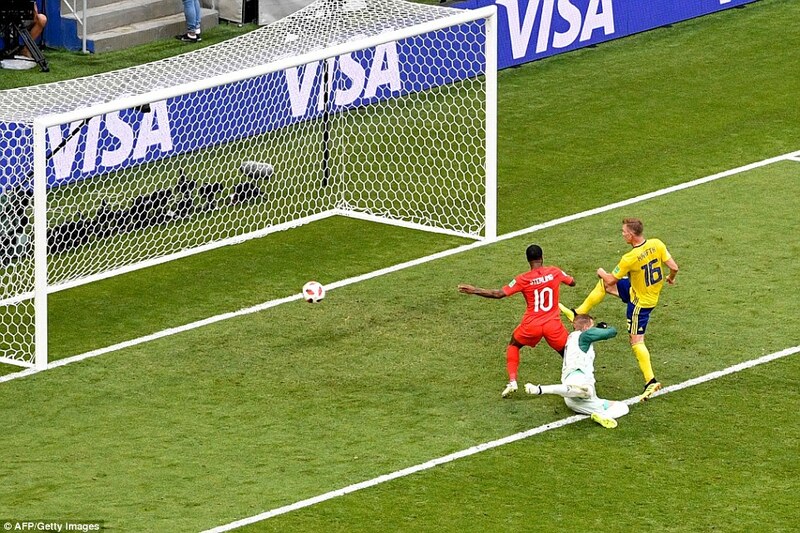 The six-goal captain swept a shot at goal from 20 yards but was a yard off target. 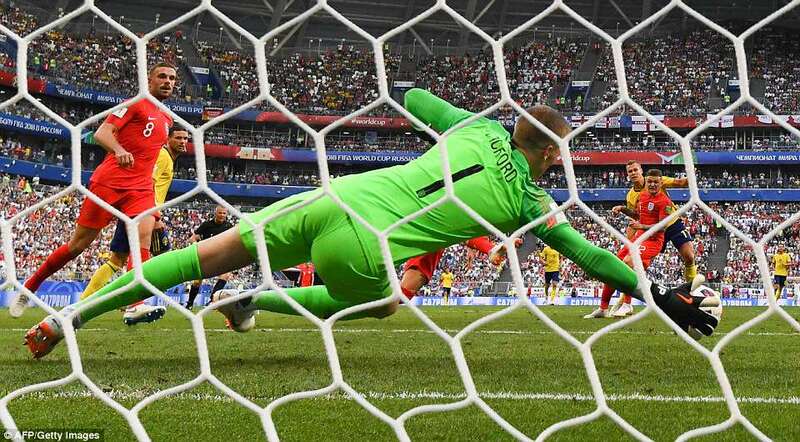 The game had taken on a sluggish pace when Viktor Claesson was given space to shoot from 25 yards and let fly as England backed off. 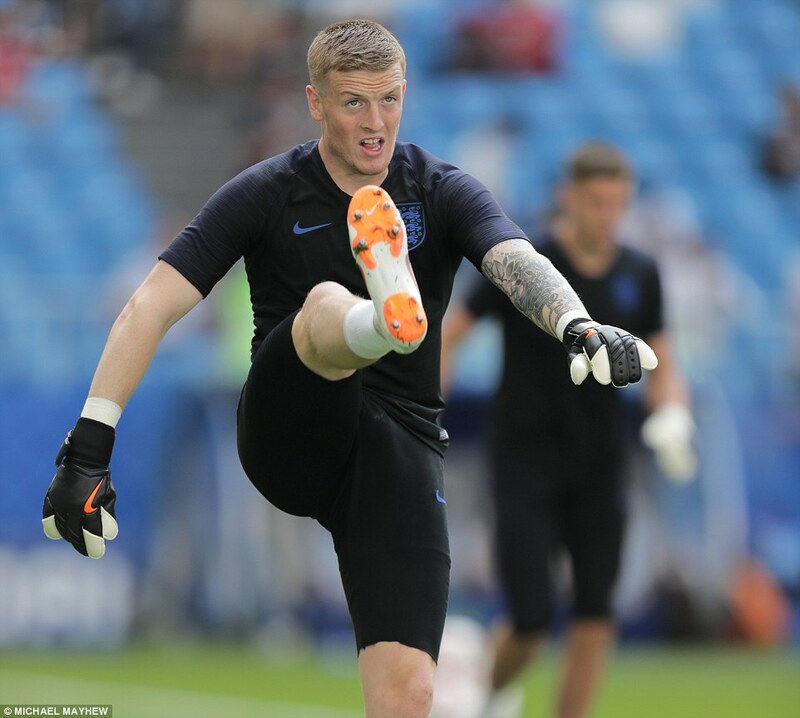 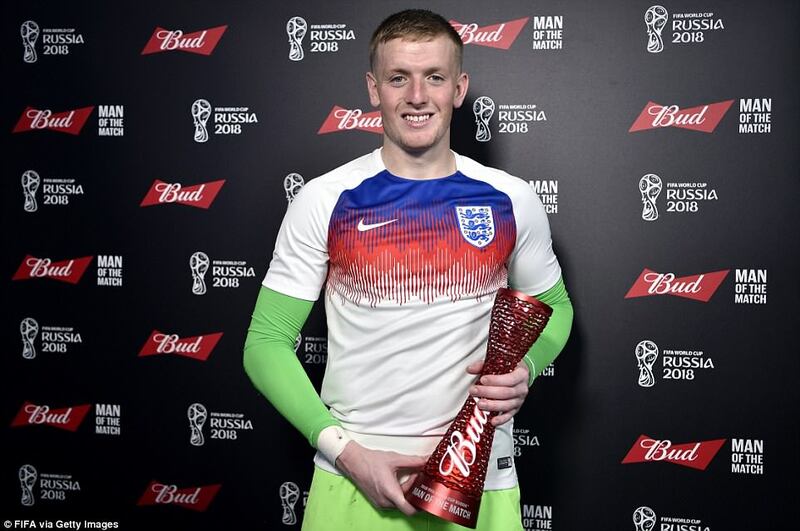 The shot sailed comfortably high and wide but goalkeeper Jordan Pickford was furious at the opening that had been offered and loudly remonstrated with his defenders. 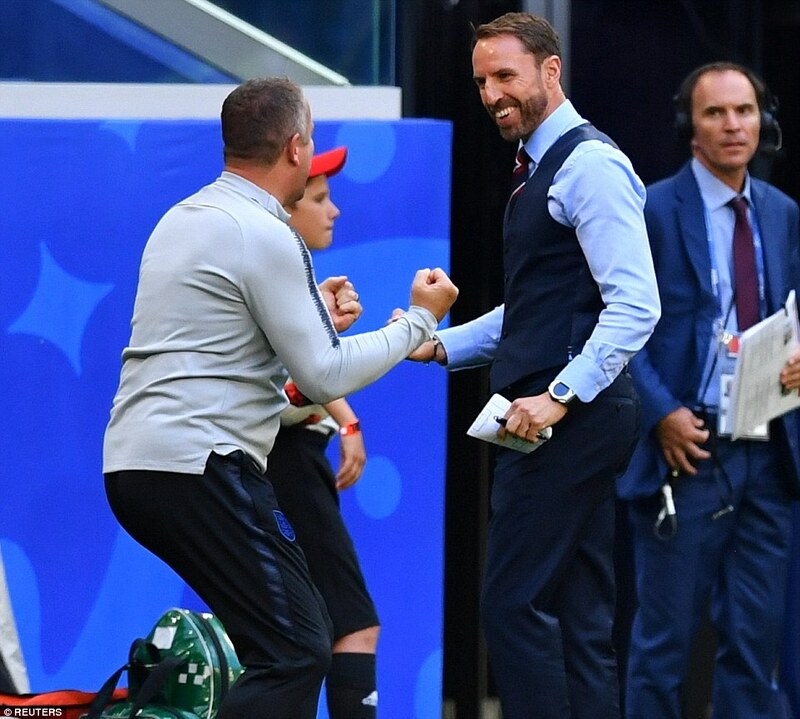 Prince William could not contain his excitement as England secured a place in the World Cup semi-final. 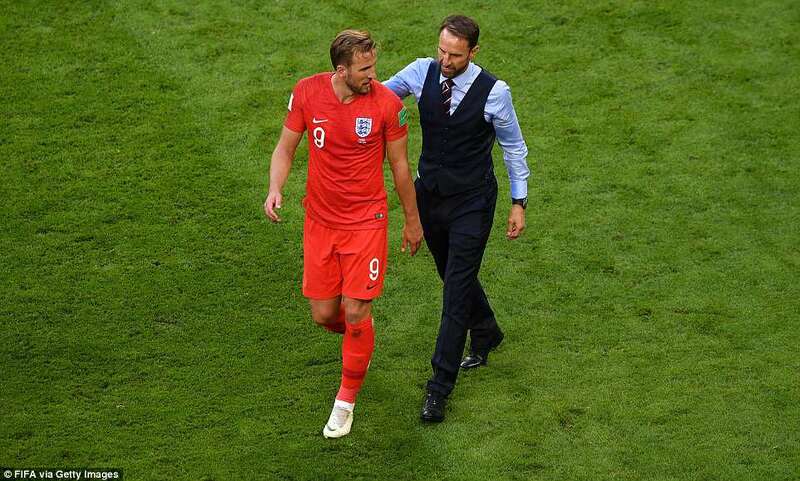 The Duke of Cambridge, President of the Football Association, tweeted ‘Football’s coming home’ after England beat Sweden 2-0 in Samara. 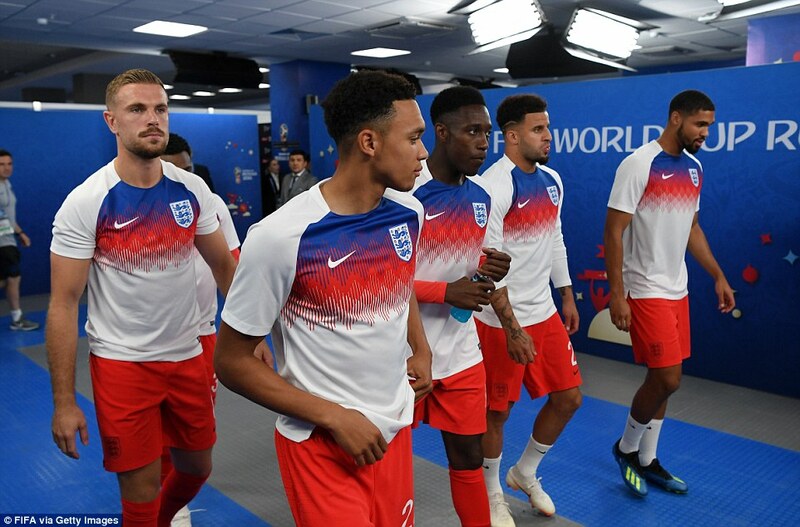 The Prince, who supports Aston Villa and regularly plays 5-aside, tweeted: ‘You wanted to make history @England and you are doing just that. 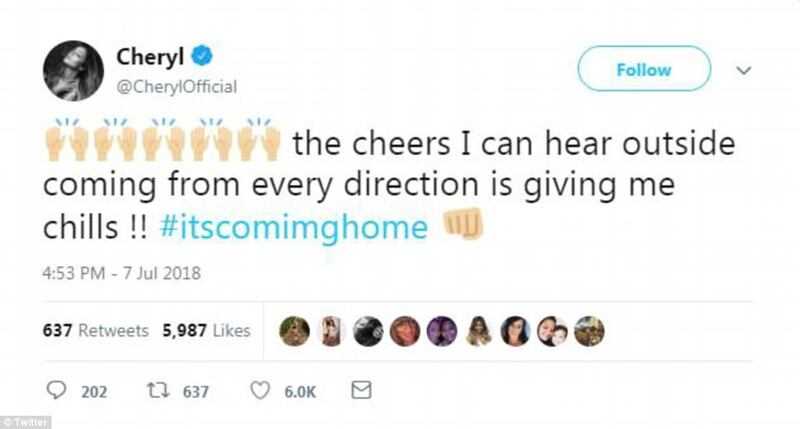 He signed off ‘W’ which shows it was a personal tweet from him on the @KensingtonRoyal official twitter site. 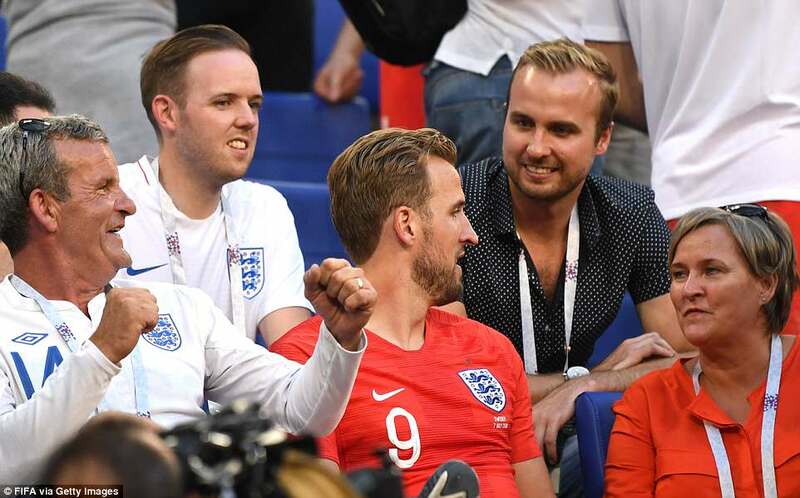 Elsewhere Twitter exploded with hilarious #ENGSWE memes celebrating the match result. 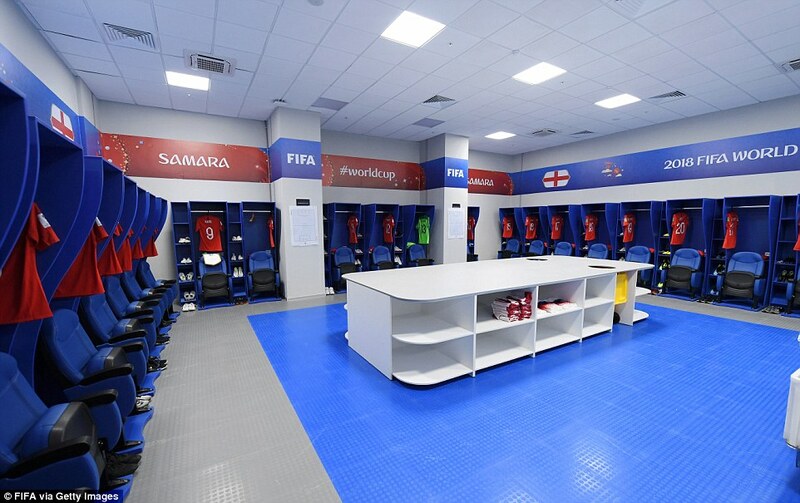 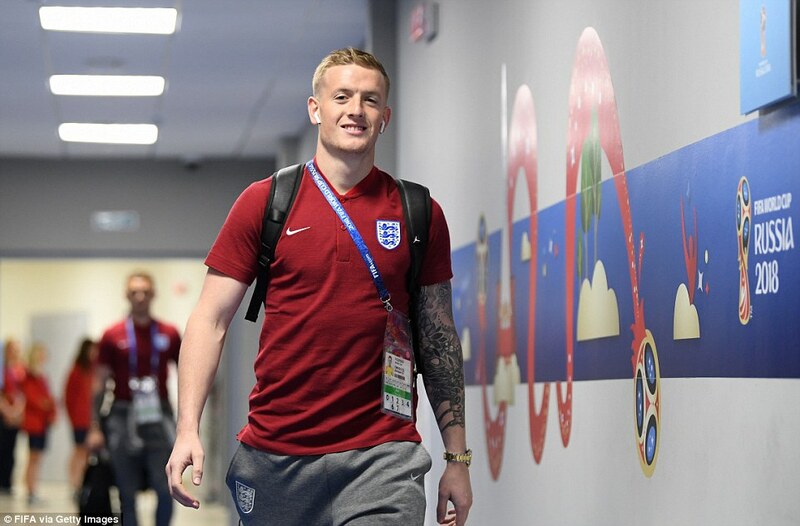 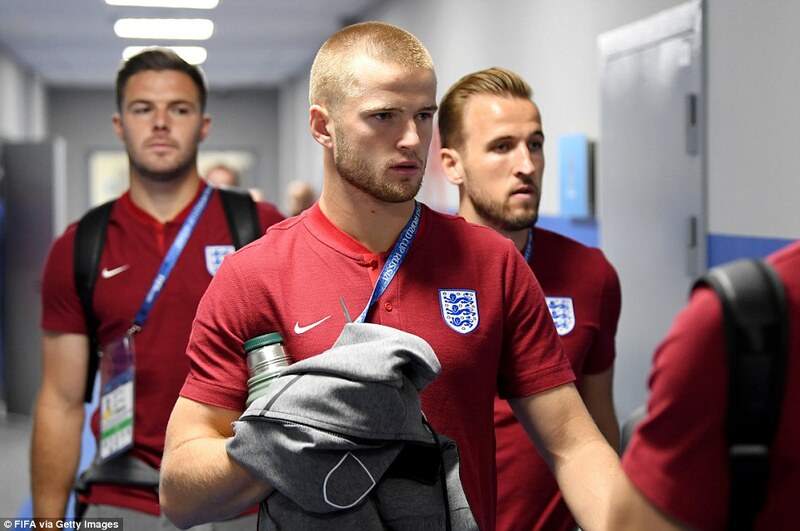 Prior to kick-off, while the team warmed-up, a bevy of WAGs – including Jamie Vardy’s wife Rebekah and Harry Maguire’s girlfriend Fern Hawkins – took to social media to reveal their nerves for their team, after boarding private jets to fly to Samara from the base in Repino. 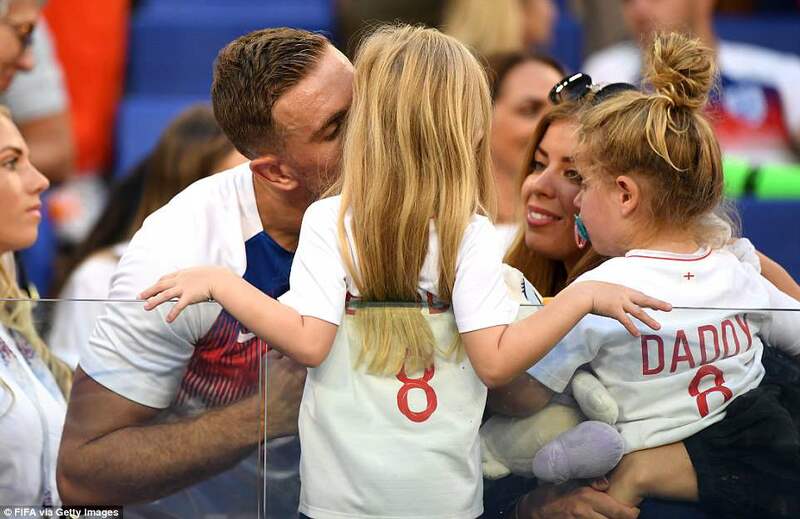 Rebekah led the way, as she continued to show off her patriotism and support for her husband Jamie, 31, as she flew her kids Megan, Taylor, Sofia and Finley, to the match, shortly before revealing she was hitting the wine while Fern followed suit with a frosty glass of bubbles – four hours before kick-off. 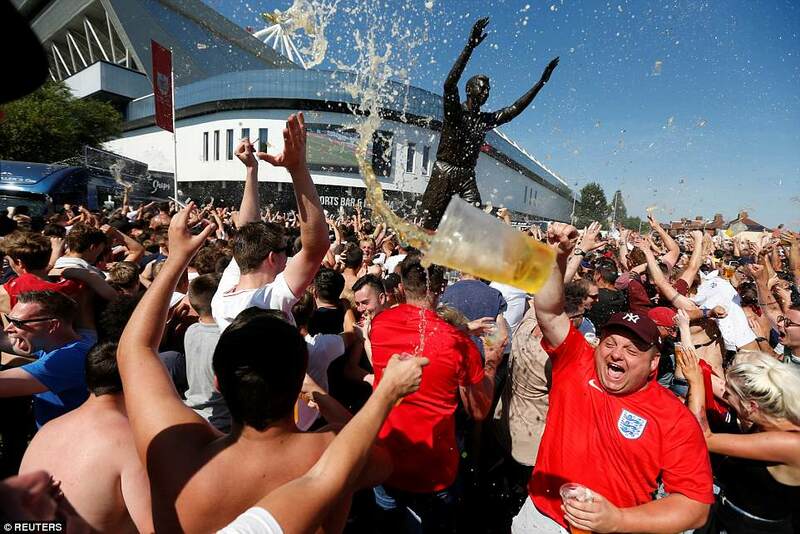 Ahead of hitting the jet, Rebekah smoldered in the thigh-grazing mini-dress which clung to her envy-inducing curves. 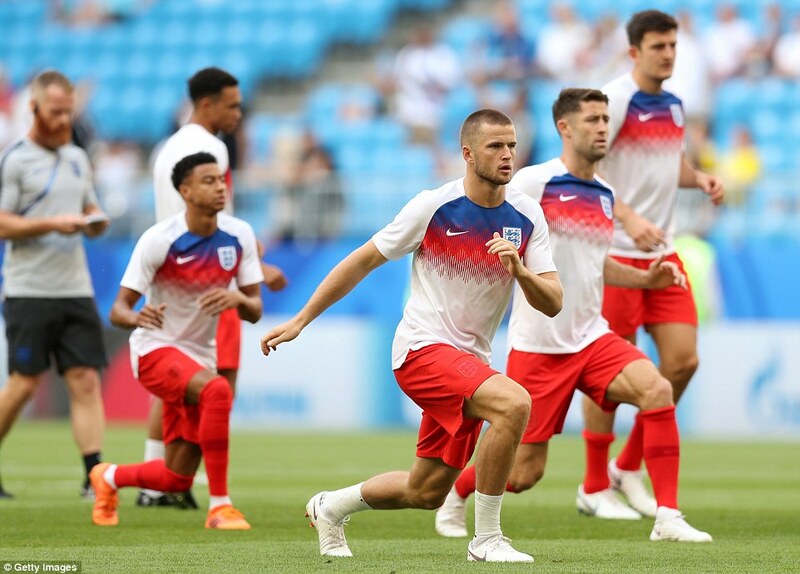 In homage to the team, the white mini featured a football with ‘England 2018’ emblazoned on the front. 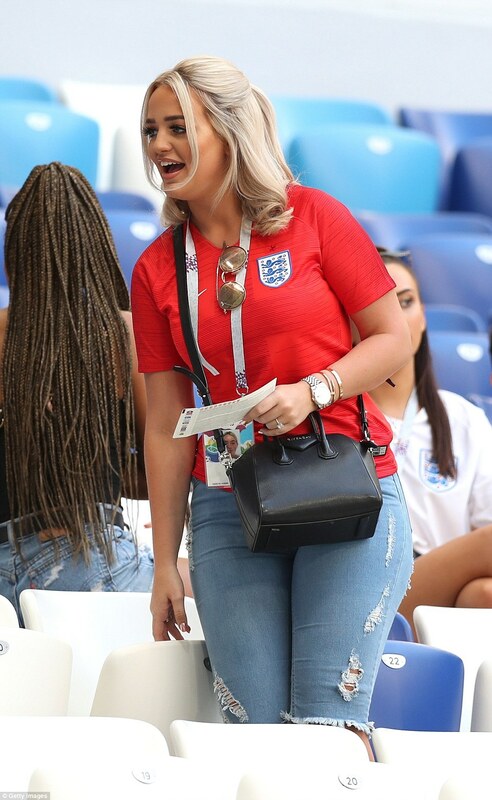 Letting her brunette tresses cascade over her shoulder, Rebekah teamed the look with a pair of chic white trainers. 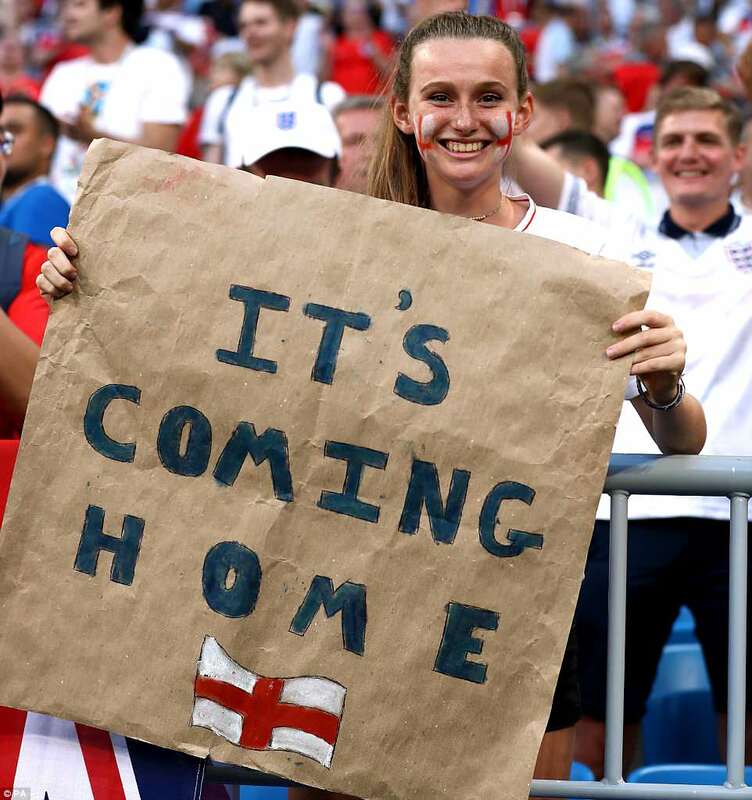 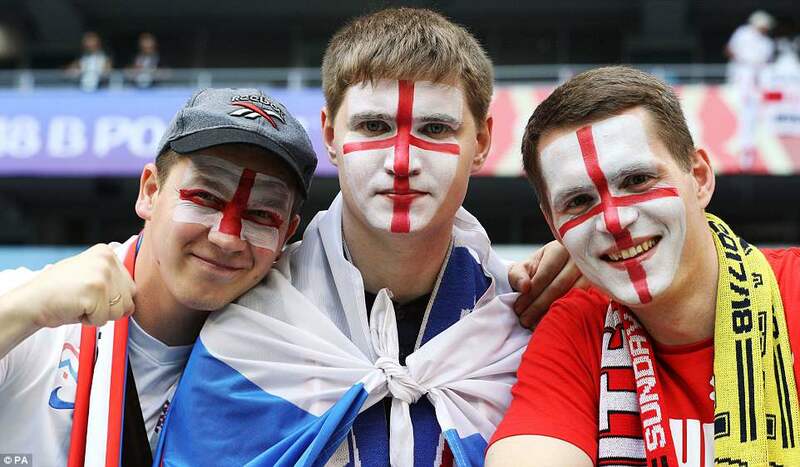 She captioned the post: ‘Come On England’. 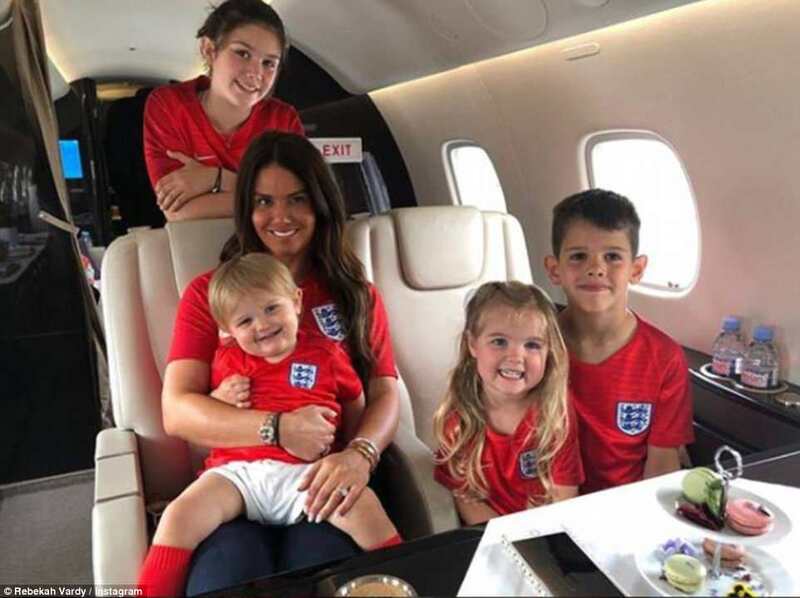 In another post Rebekah shared a snap of her four children, with the whole family donning red England shirts as they sat in the private jet. 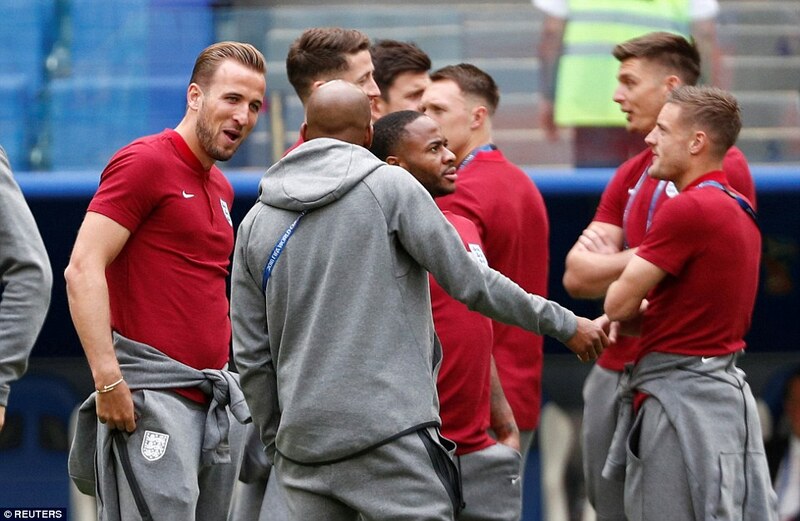 The wives and girlfriends of Gareth Southgate’s team have been staying in Saint Petersburg, where the footballers have their base in Repino, before the team flew over to Samara on Friday afternoon. 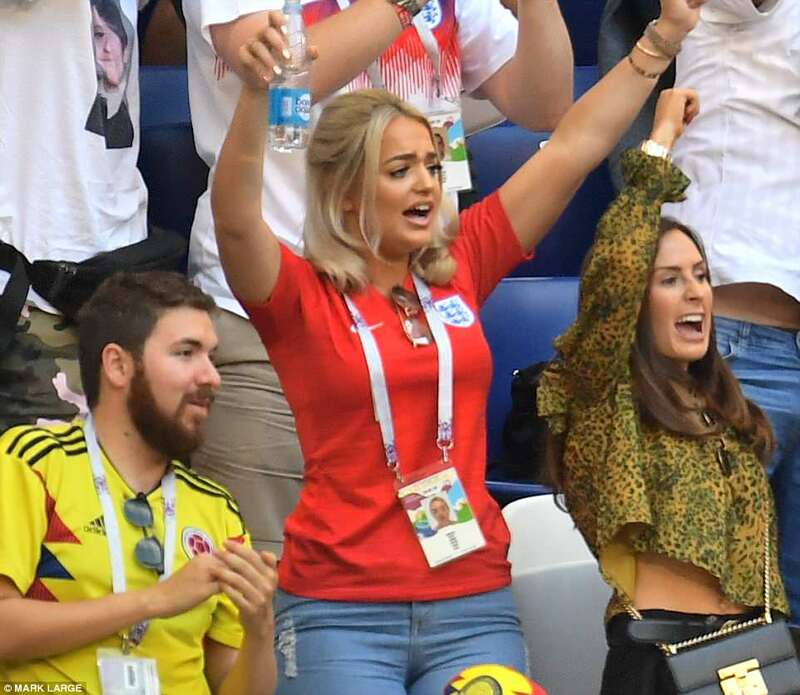 Harry Maguire’s long-term girlfriend Fern was begroaning her early start as she took to social media to share a snap of the dreary runway while layering the time over the top of the shot – revealing it was 7.52am. 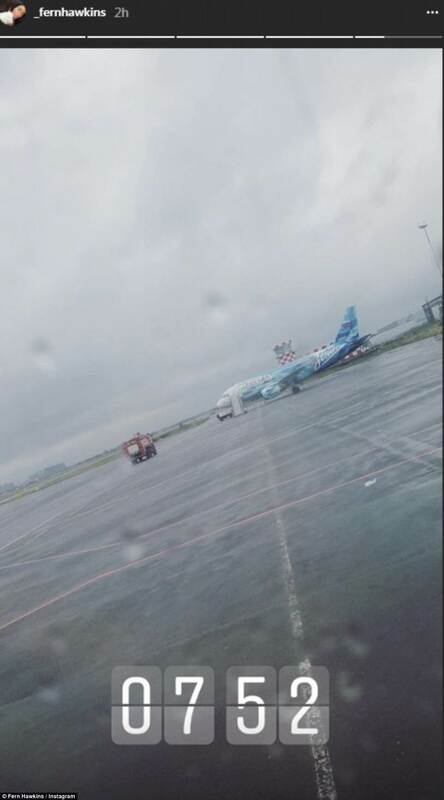 Rebekah too shared a snap of the plane’s departure from her window, writing early start alongside an unhappy face. 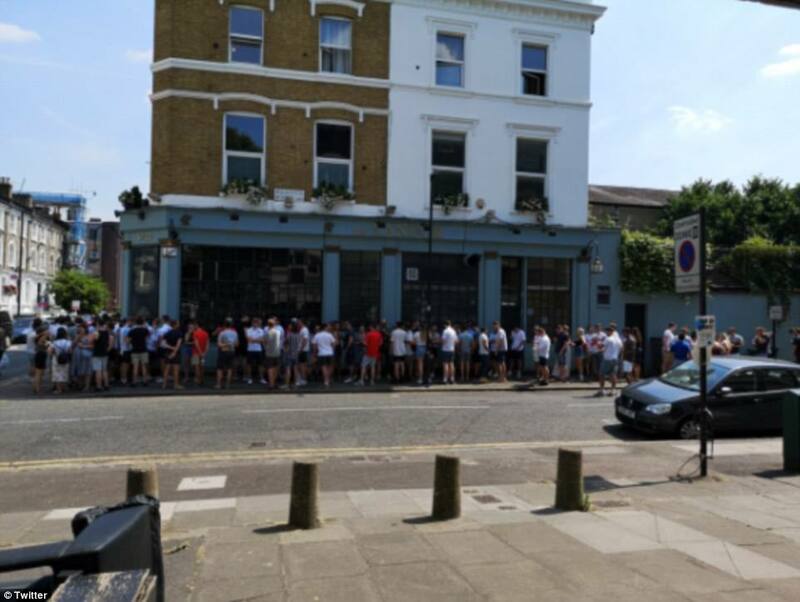 England supporters have been queuing up for four hours outside pubs in boiling heat to watch the Three Lions take on Sweden in their World Cup Quarter-final clash. 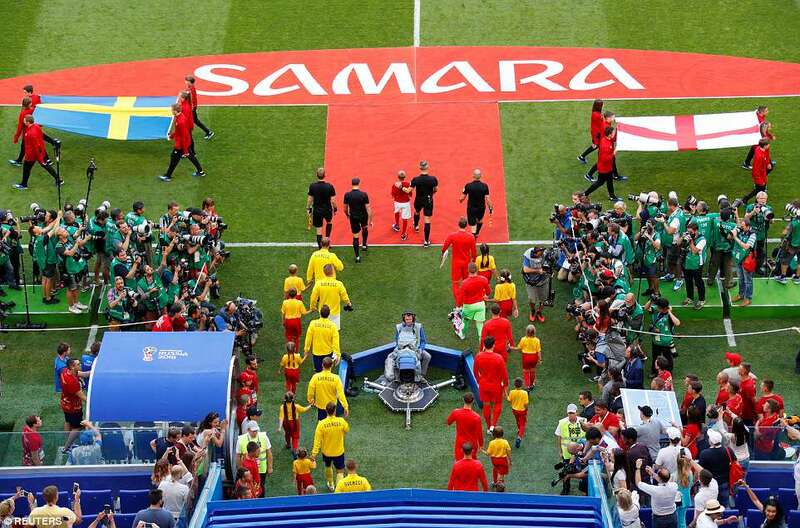 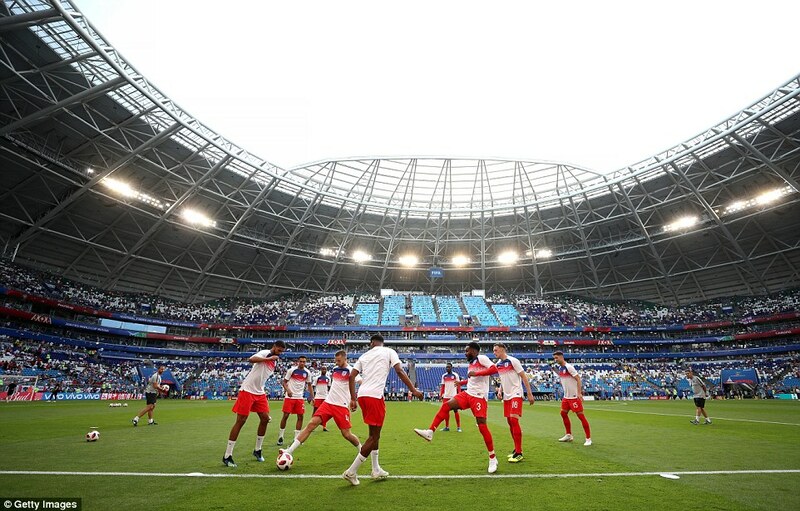 The crunch match at the Samara Arena brought the country to a standstill as a total of 32 million viewers – the biggest TV audience in living memory – tuned in. 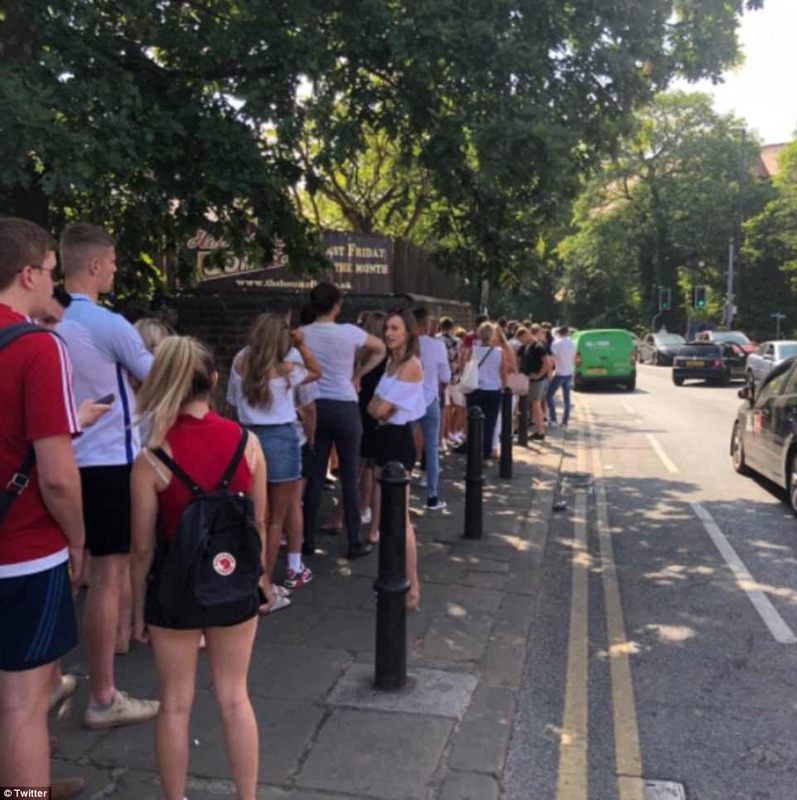 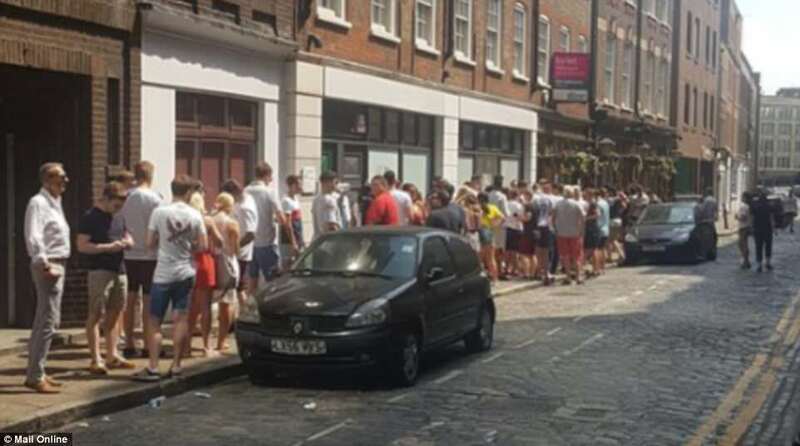 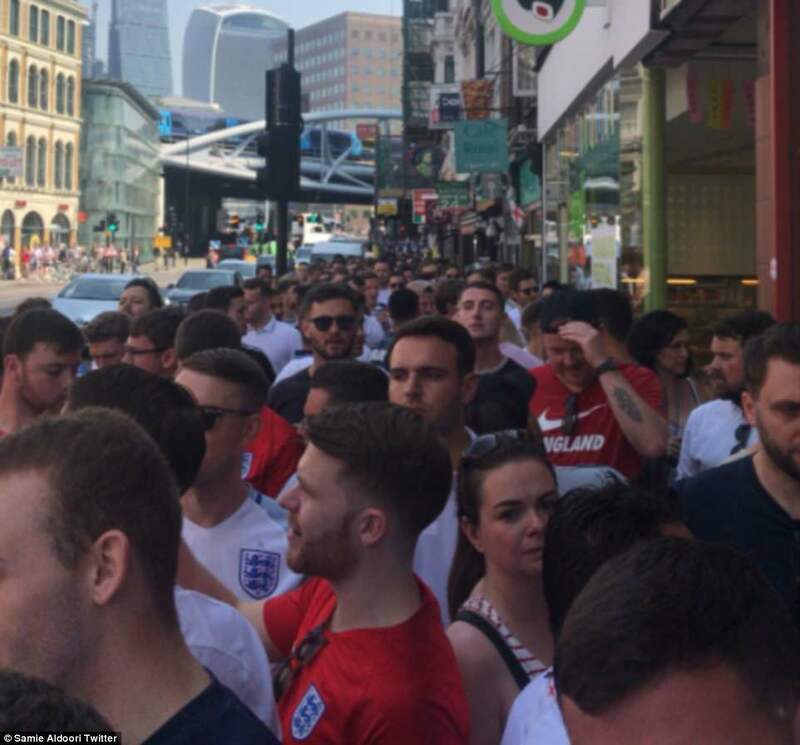 Fervent football fans were pictured standing outside pubs in London as early as 10am this morning in sizzling 91.5F (33C) heat to secure a space inside. 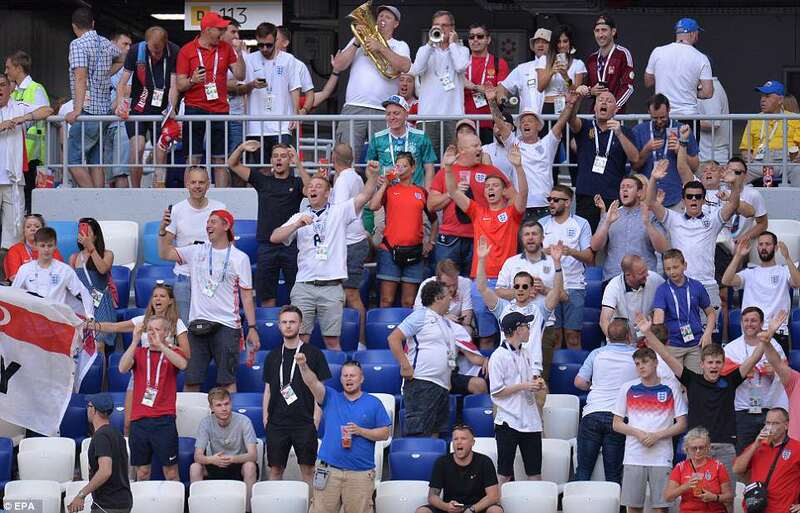 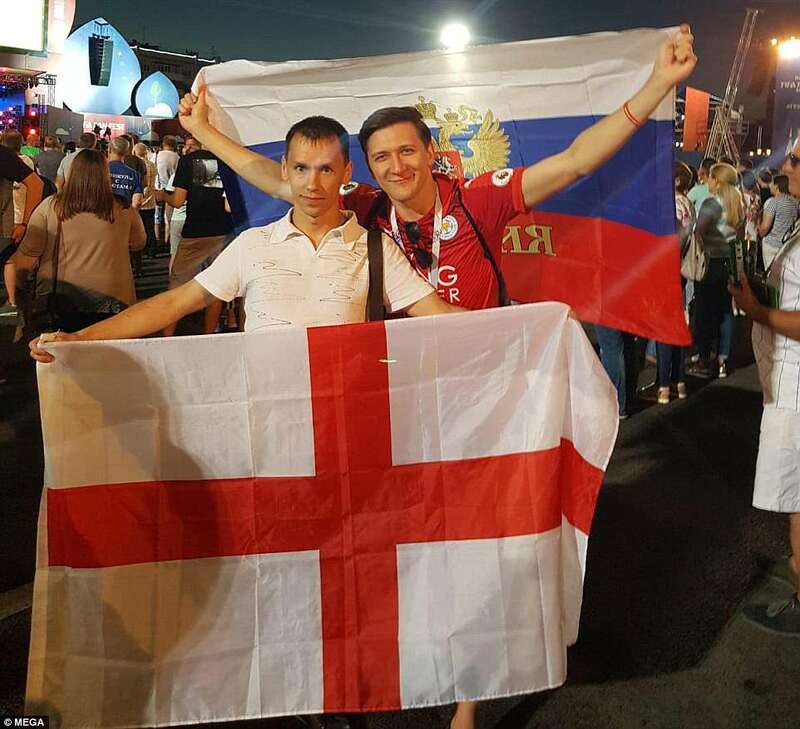 England’s victories so far in Russia have sparked scenes of wild celebration here and the atmosphere today was even more electric. 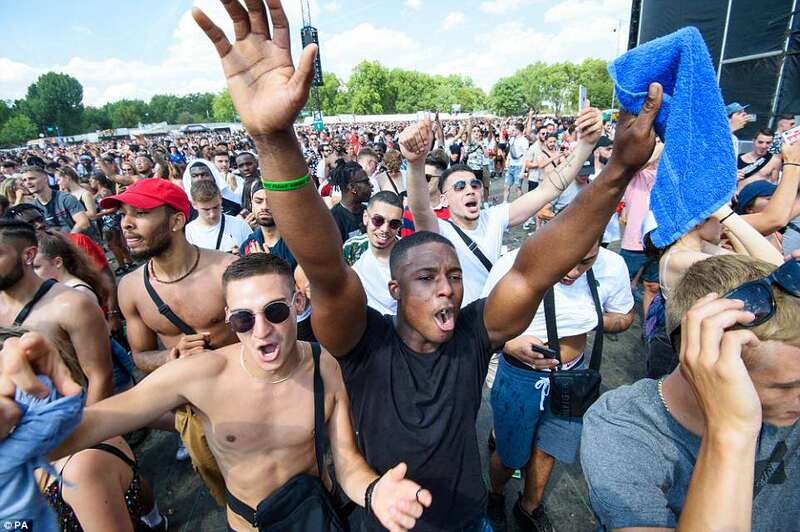 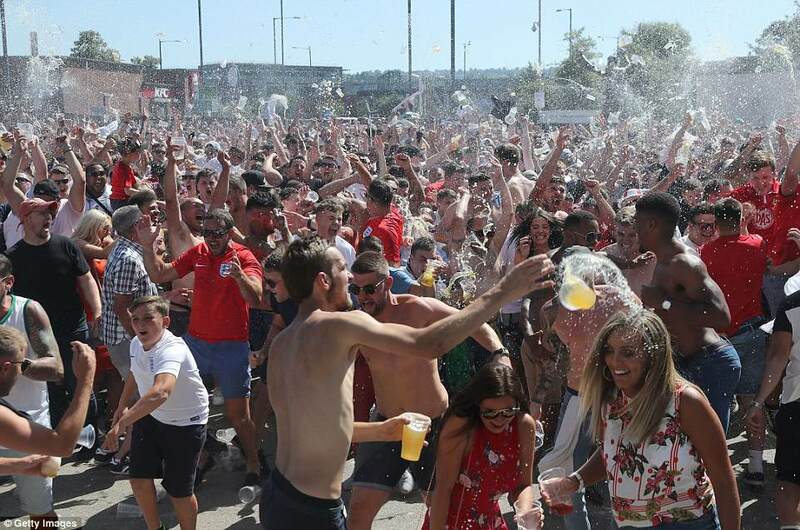 Elsewhere, crowds flocked to outdoor big screens in cities including London, Birmingham, Liverpool, Manchester, Newcastle, Bristol, Exeter and Leeds to make the most of the beautiful weather while watching the game. 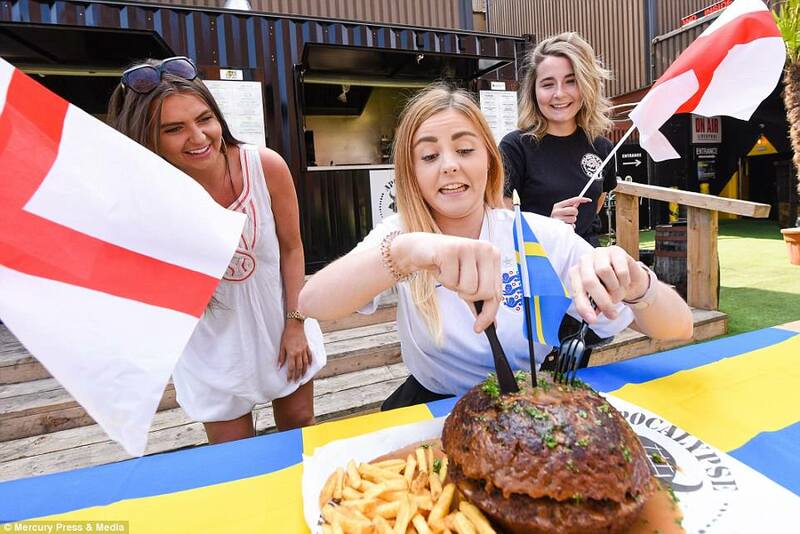 To help keep cool – or steady the nerves – 38 million pints of beer were drunk by fans as the latest chapter in captain Harry Kane and the team’s Russian adventure triggered a £190million big-game drinks and food spree. 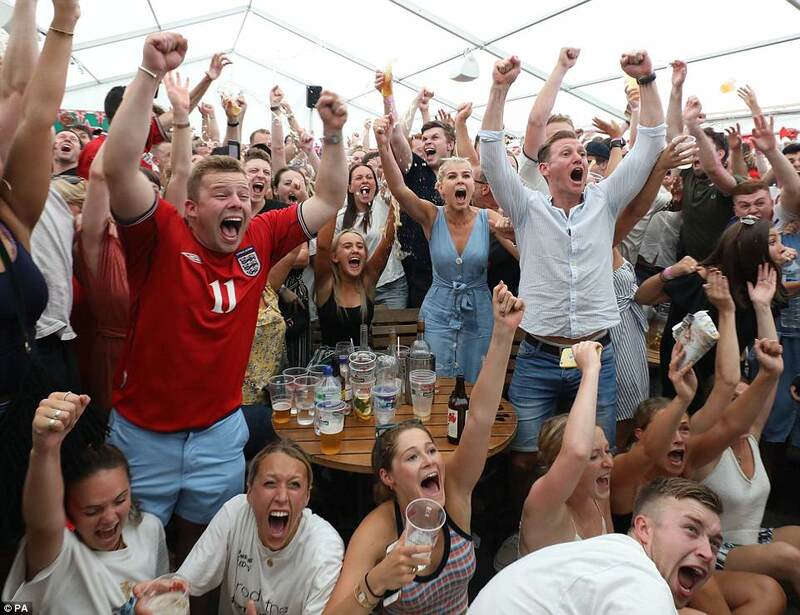 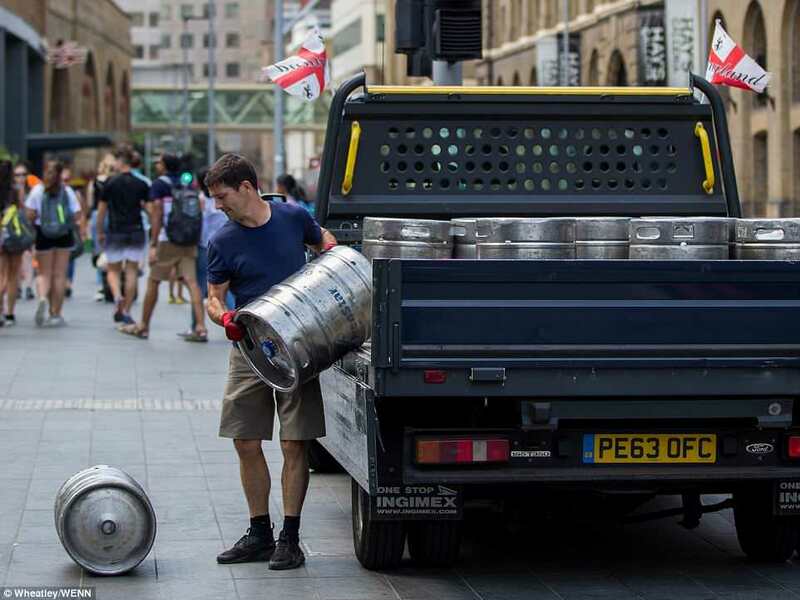 Some 18 million pints were downed in pubs – 7 million more than usual – with pub takings soaring to £100 million as a predicted 3.5 million fans pack the country’s 40,000 pubs to watch the match. 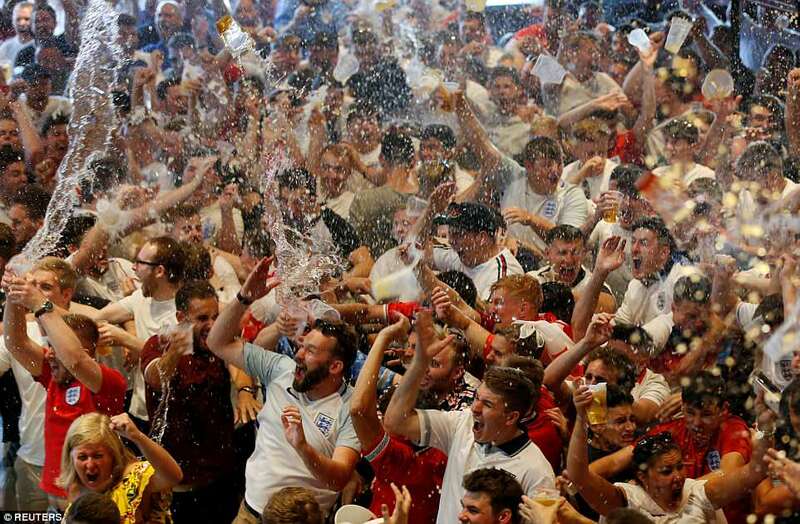 At home, 20m pints are expected to be drunk today costing around £22m, the British Beer and Pub Association (BBPA) said. 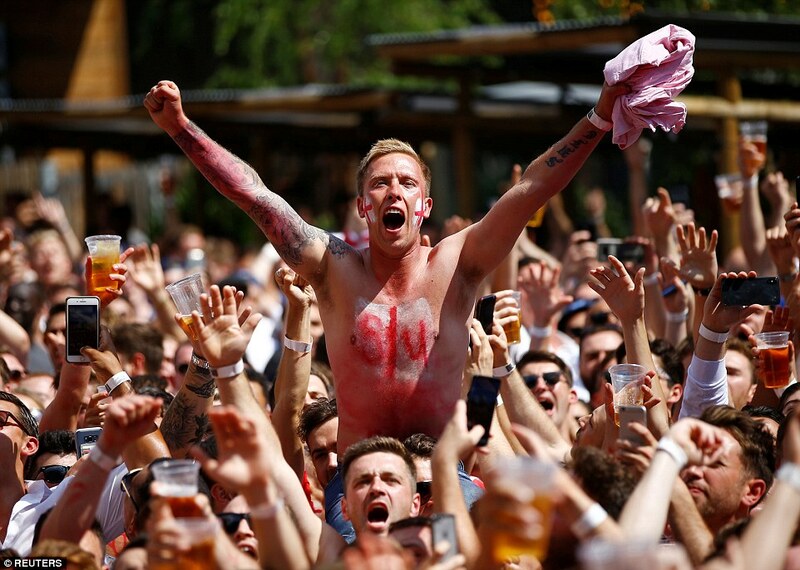 Food spending on the match will add up to another £30m in pubs and £40m at home. 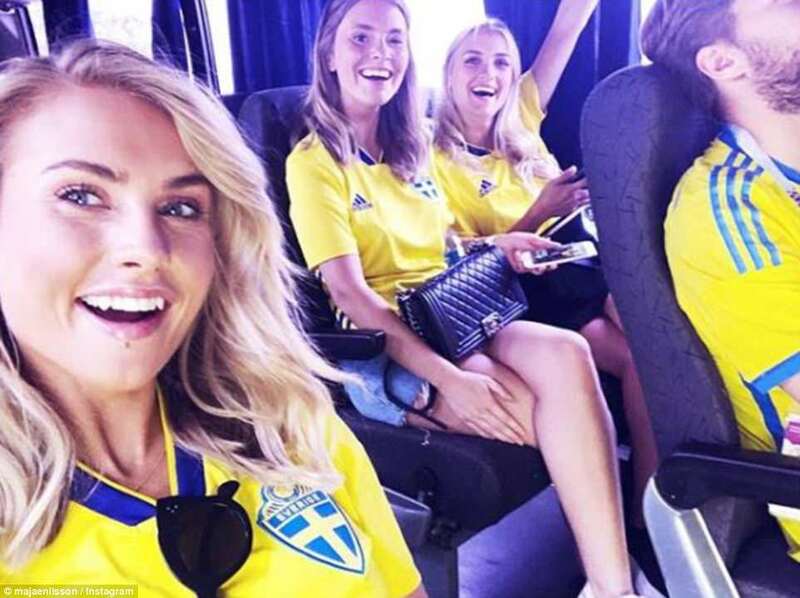 Swedish WAGs geared up to cheer on their footballing husbands by taking to Instagram to showcase their support. 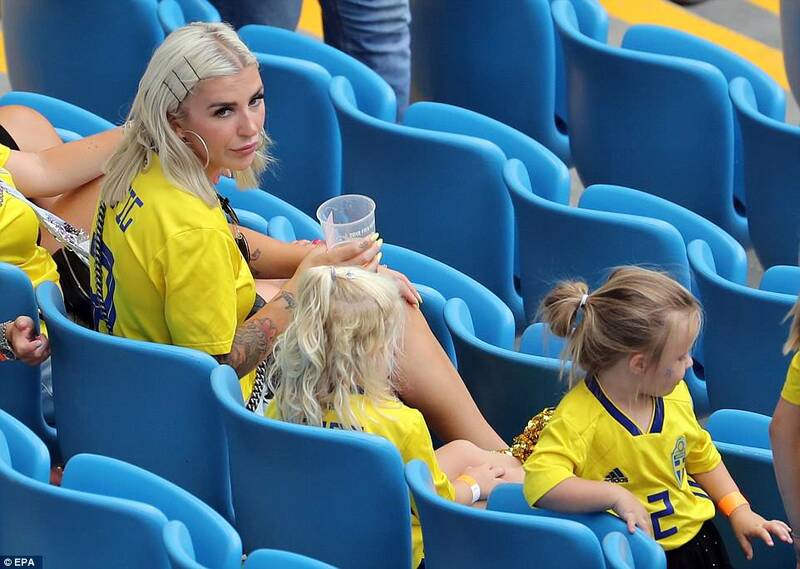 Donning Sweden‘s famous yellow shirts, the wives and girlfriends of Sweden’s players prepared for the game in Samara, Russia today. 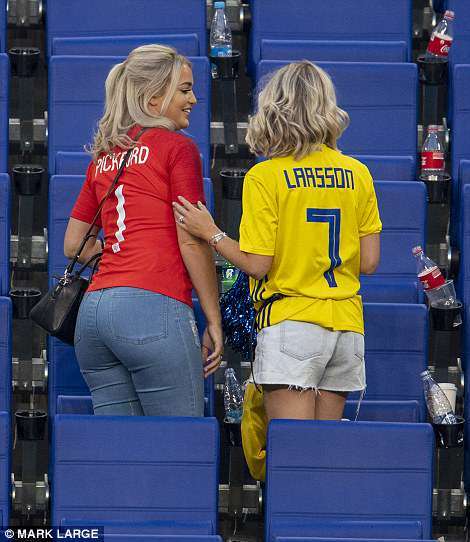 And while England’s chief WAG is Rebekah Vardy, the leader of Sweden’s contingent is Maja Nilsson. 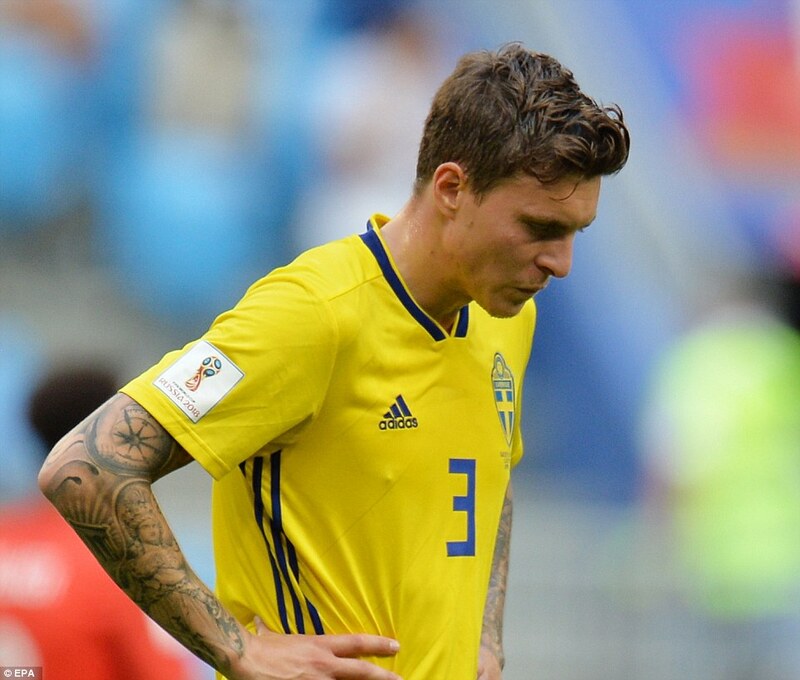 Maja married Manchester United defender Lindelof in Sweden last month after getting engaged in the Maldives. 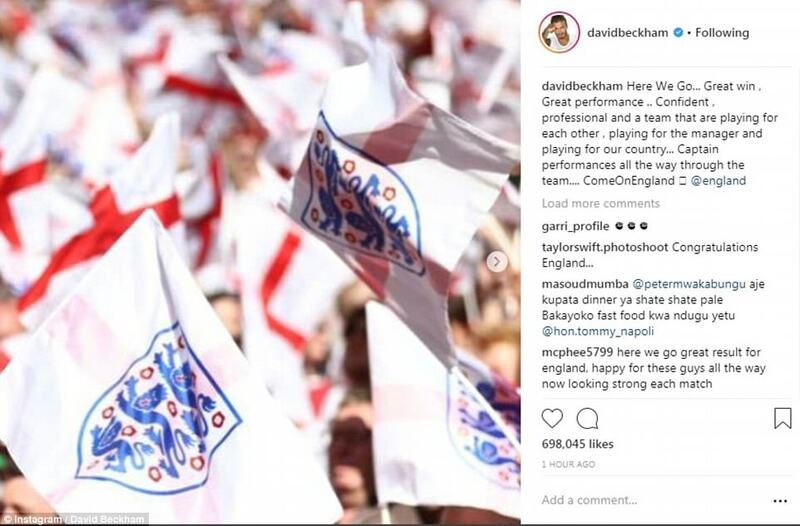 She later shared photos of the beautiful countryside ceremony on her personal blog and Instagram, where she boasts 114,00 followers. 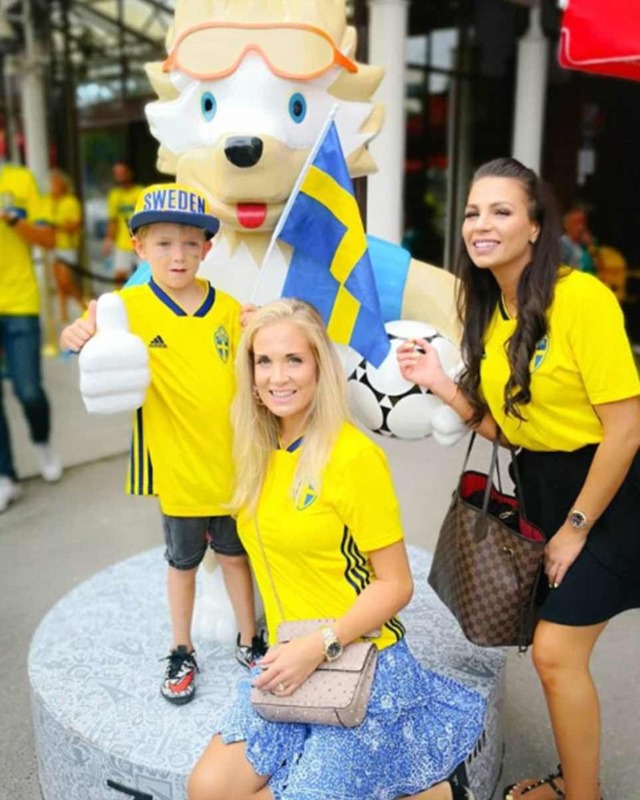 The glamorous blonde who works in marketing is a blogger and also hosts a podcast alongside fellow WAG and best friend Sanna Dahlstrom. 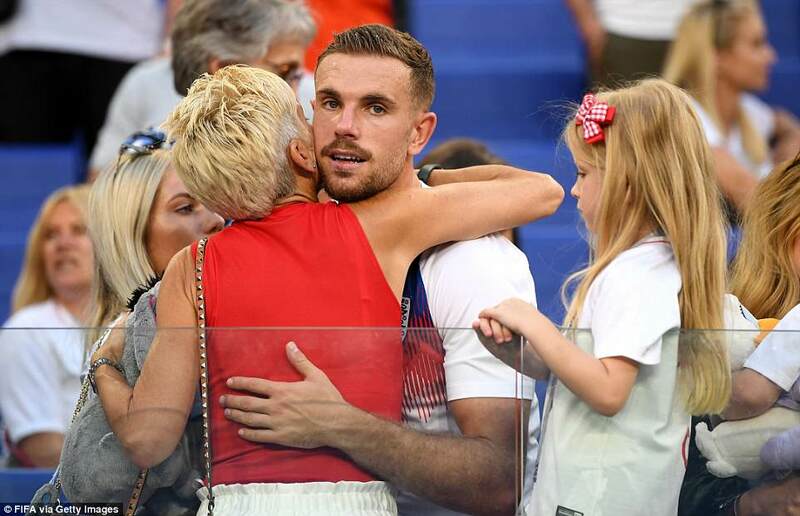 And she’s become known for her forthright views, coming under fire from some United fans when she hit out at bosses over the ‘disgusting’ cost of executive boxes at Old Trafford. 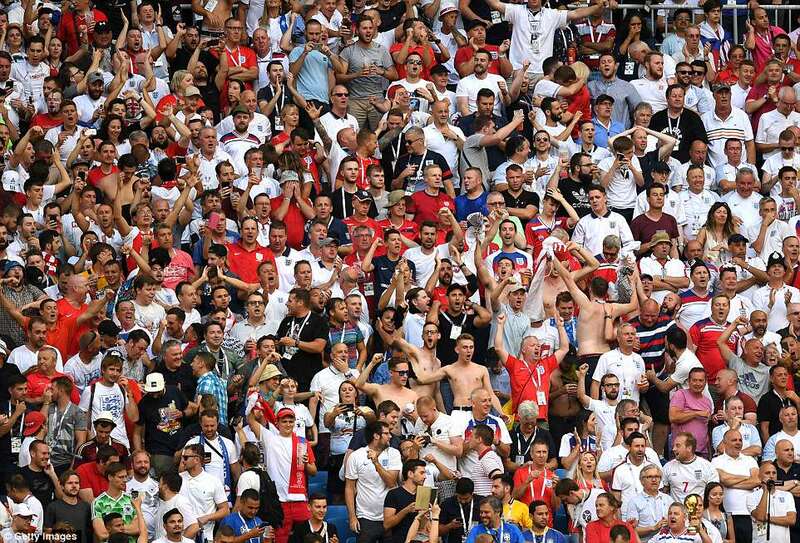 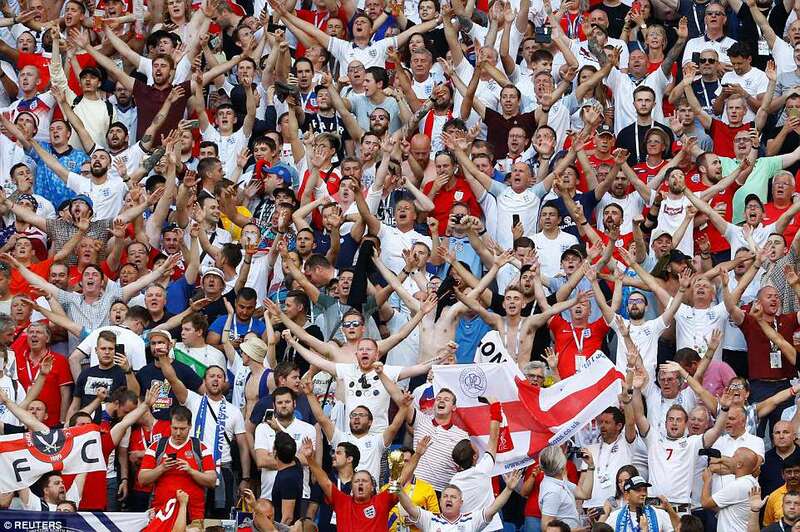 Rather shockingly, around 10,000 tickets remain unsold for England’s match against Sweden, as 32m Brits worldwide gear-up to watch the game on TV. 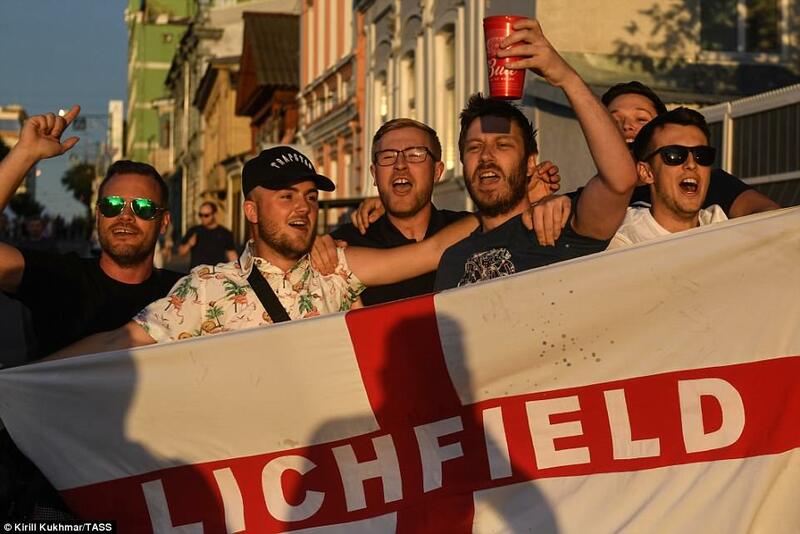 Just 2,836 tickets have been sold to England supporters for the game in which they are likely to be vastly outnumbered by Swedish fans. 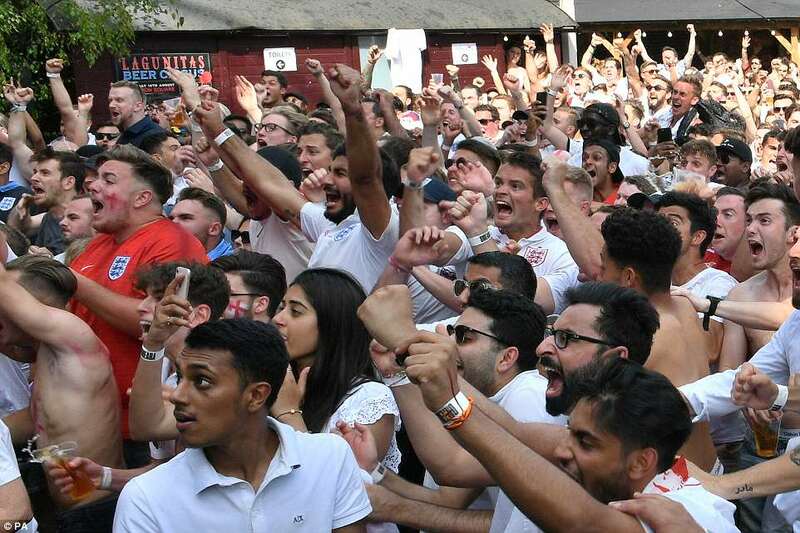 In comparison, more fans were expected to watch the game at a free screening at Nottingham Castle – 3,000 people, according to Sky. 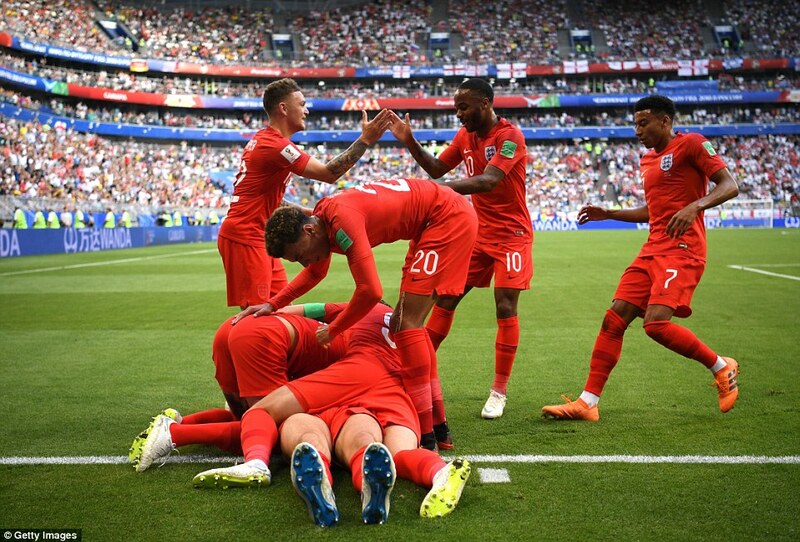 England’s thrilling victory over Colombia was watched by a whopping 23.8m people – making it the most viewed TV programme of the year. 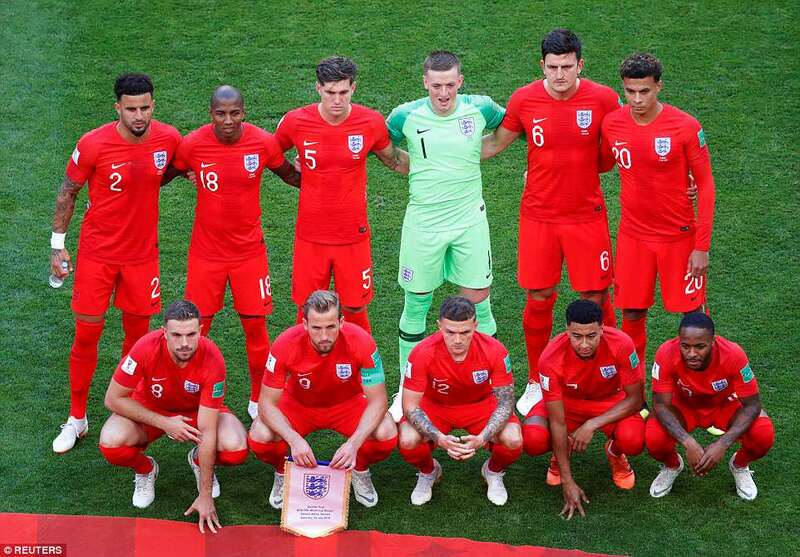 The Three Lions match against West Germany in the World Cup in Italy in 1990 is the team’s current most viewed game ever. 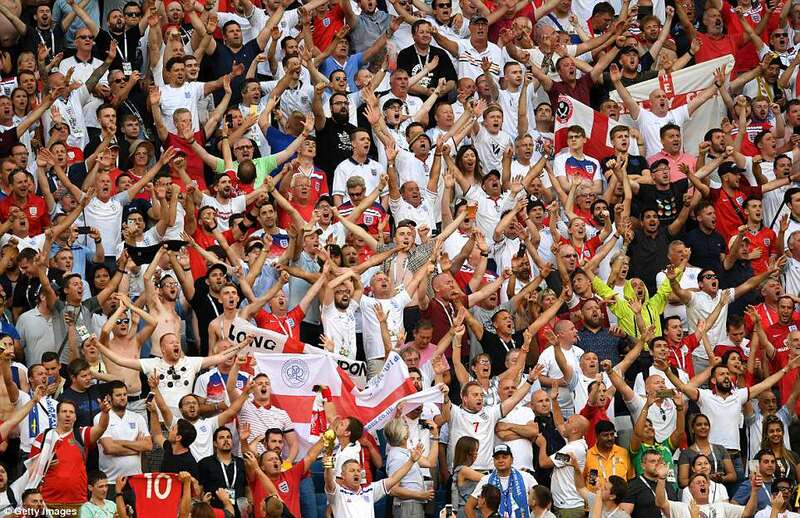 But the game against Sweden today is tipped to top the Italia 90 viewing figures, with up to 30m people expected to watch the game. 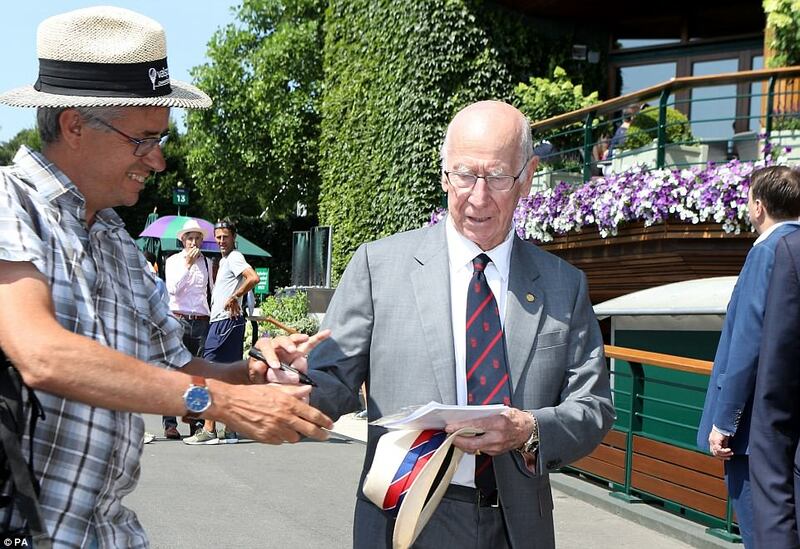 Despite England being mere hours away from their big World Cup clash against Sweden, Sir Bobby Charlton was spotted signing autographs and joining in on the fun. 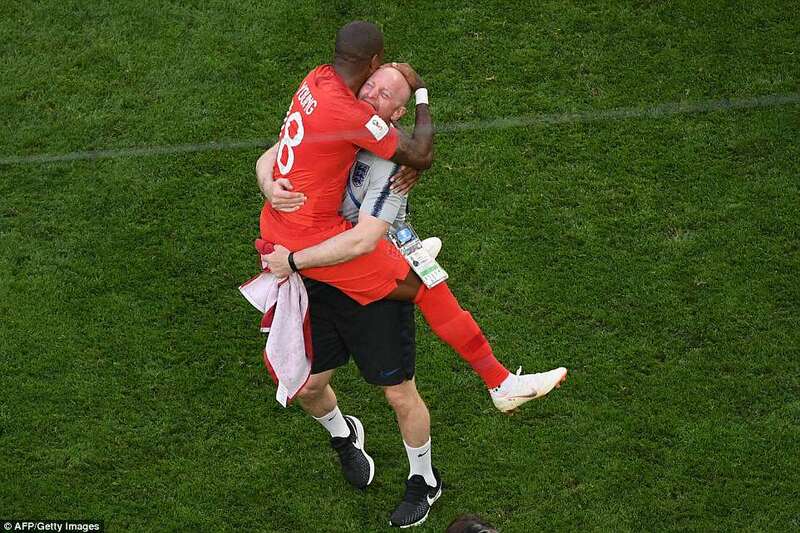 The World Cup winner seemed to be relaxed ahead a big day of sport for England with the World Cup quarter-final later and Kyle Edmund set to take on three-time Wimbledon champion Novak Djokovic. 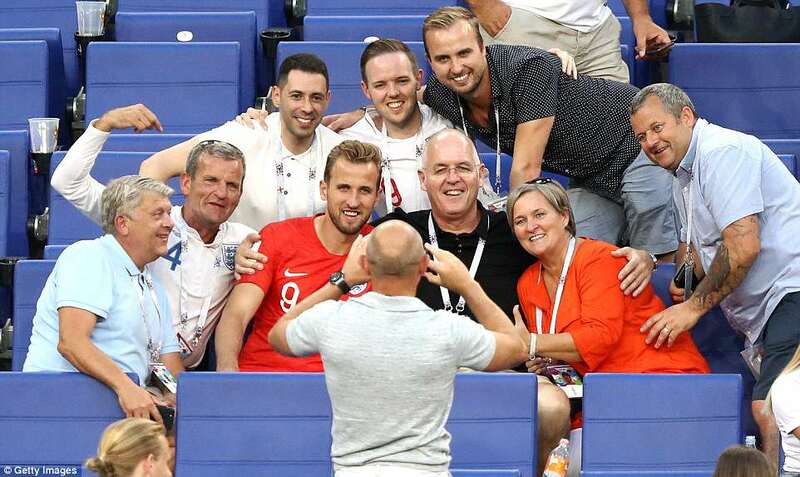 It remains to be seen whether he will be leaving Wimbledon early with the England vs Sweden game that was set to kick off at 3.00pm and Edmund’s match starting at 4.15pm. 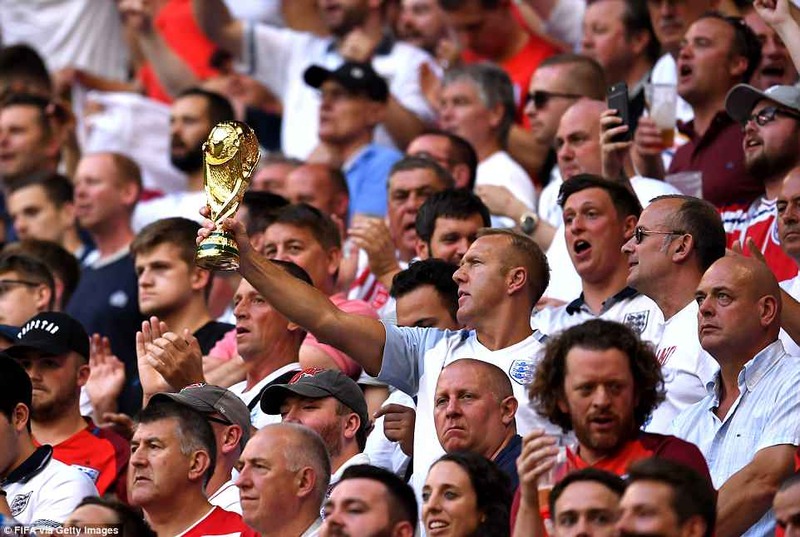 Sir Bobby was among those in the royal box on Saturday. 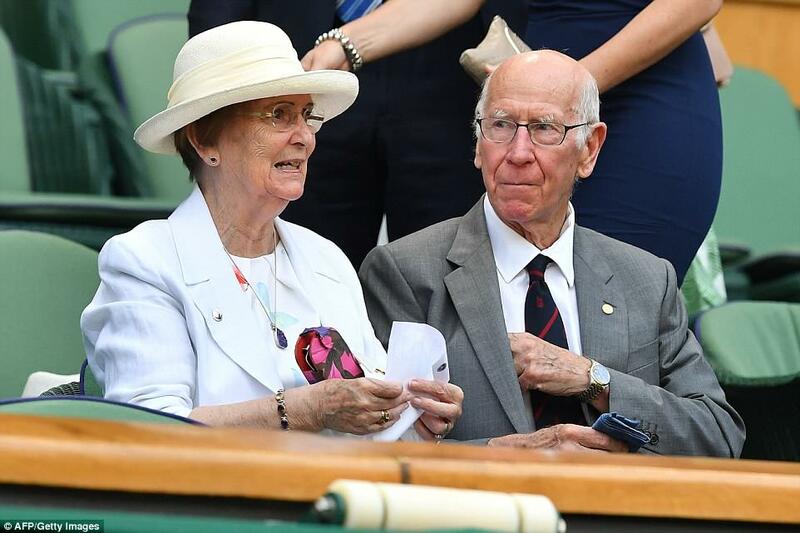 He was joined by sporting stars including Sir Mo Farah, boxer David Haye, Dame Jessica Ennis-Hill and former cricketer Andrew Strauss, on another scorching day at Wimbledon. 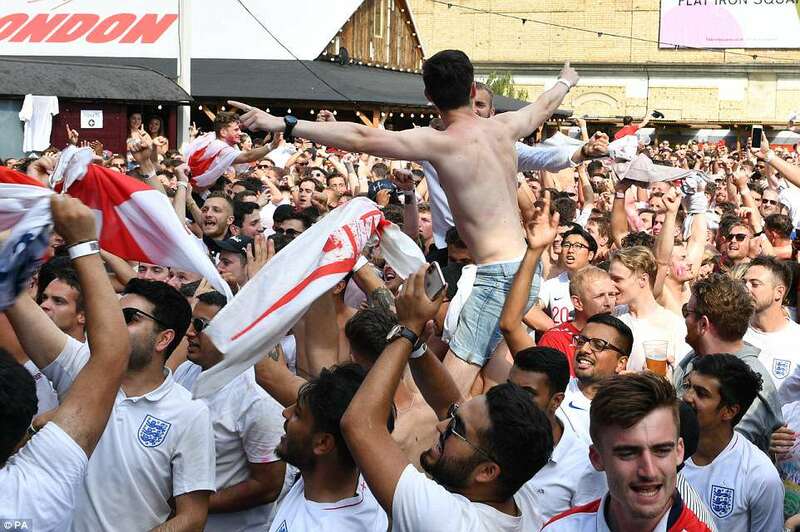 At the Rose and Crown pub in Wimbledon village, scores of fans have gathered for the England game, including many who have left Wimbledon. 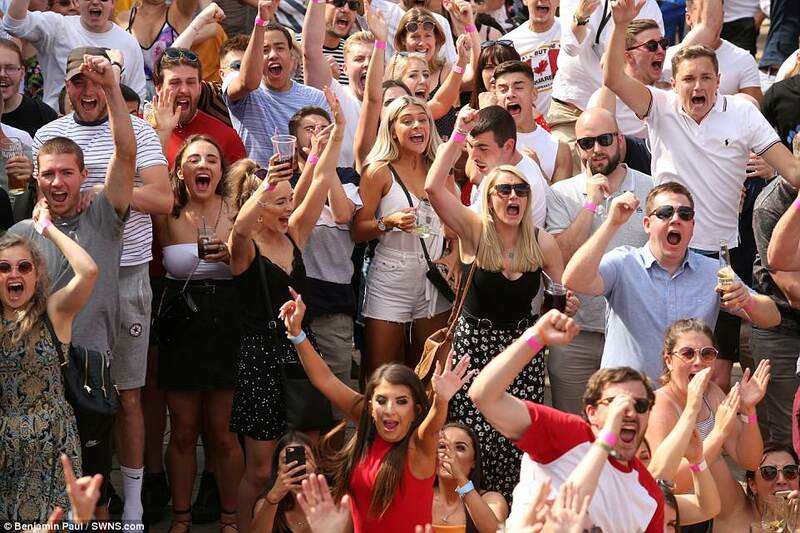 Those who have tickets for Saturday’s tennis have been issued with pink and blue re-entry wristbands. 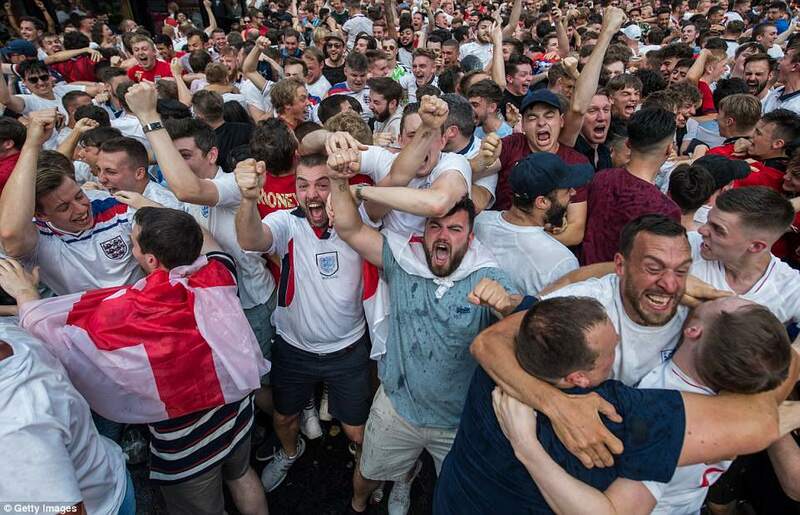 There were chants of ‘get the tennis off’ as fans waited eagerly for the football to be put on the big screens. 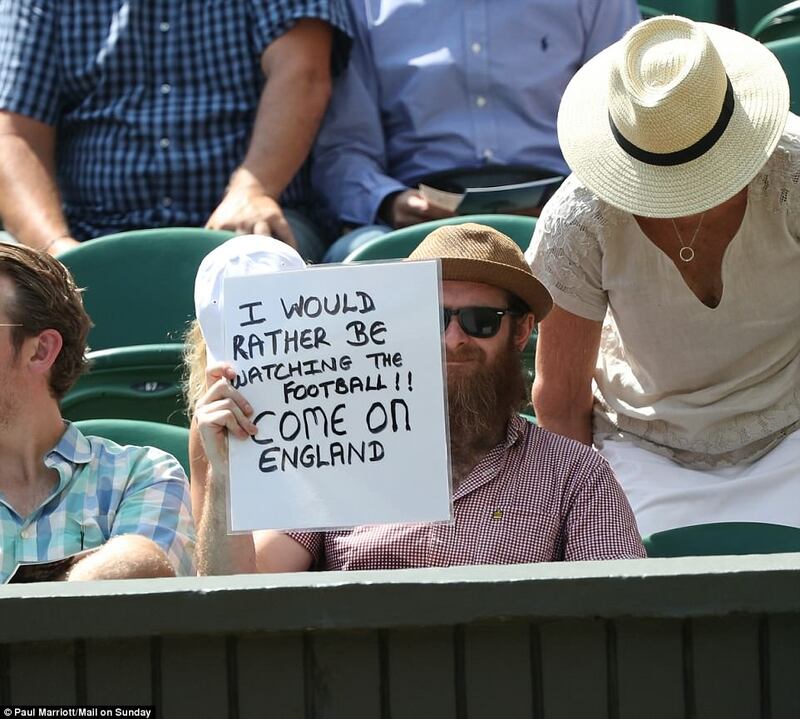 Clive McCabe, from Twickenham, has seats on Court One but has left to watch the football. 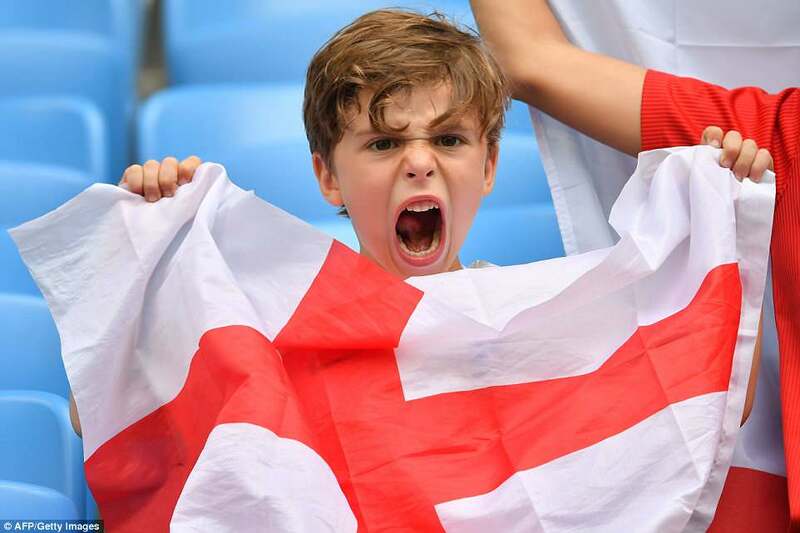 The All England Lawn Tennis Club (AELTC) announced on Friday that Edmund will play third on Centre Court, with the scheduling likely to avoid a clash between the tennis and football. 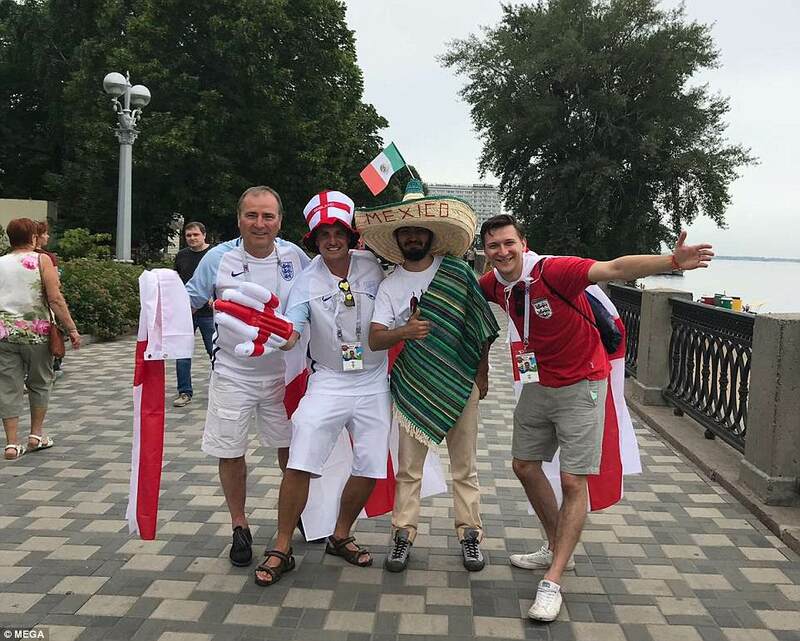 Haye admitted he would be one of those trying to juggle the two sporting events. 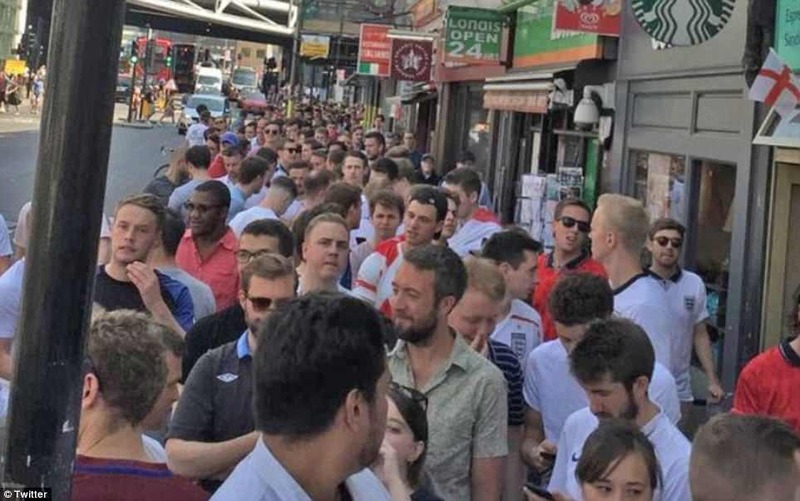 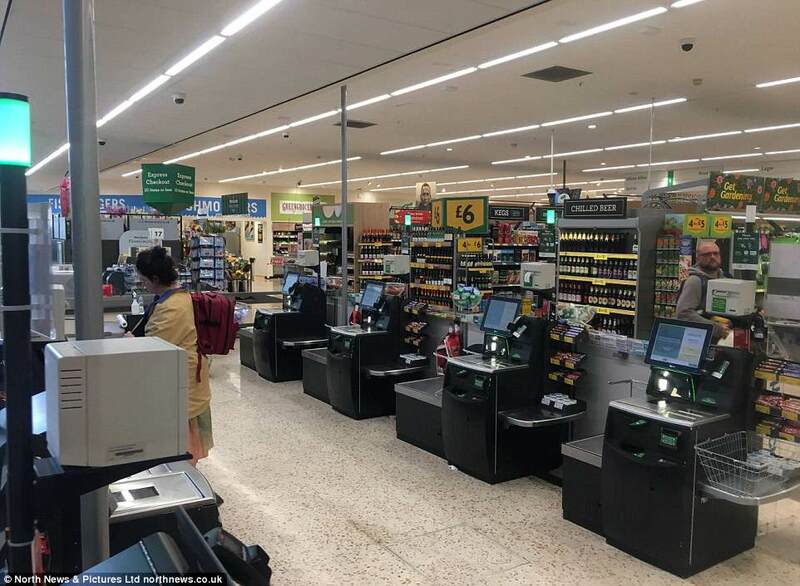 With so many watching the match, the nation came to a halt today with roads, high streets and train stations empty throughout the 90 minutes of the quarter-final. 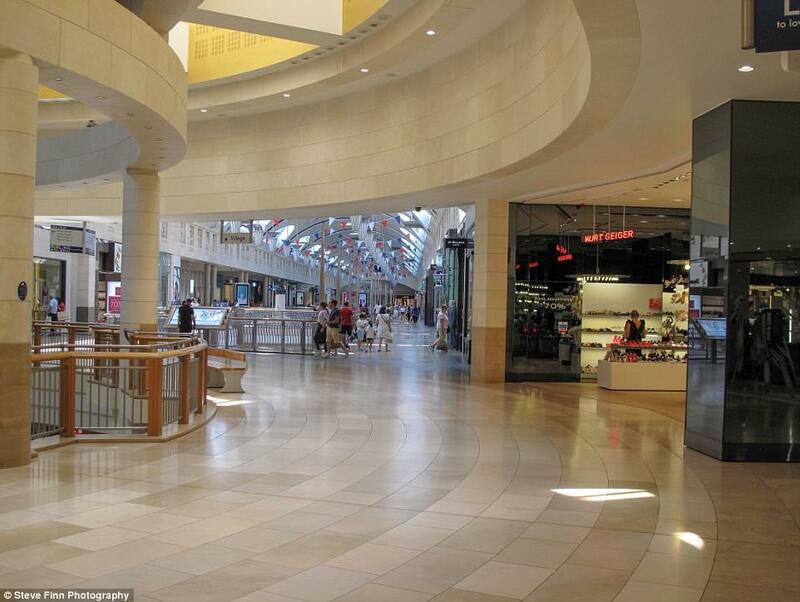 Elsewhere, shops and streets were deserted as everyone headed to the nearest screen to catch the game. 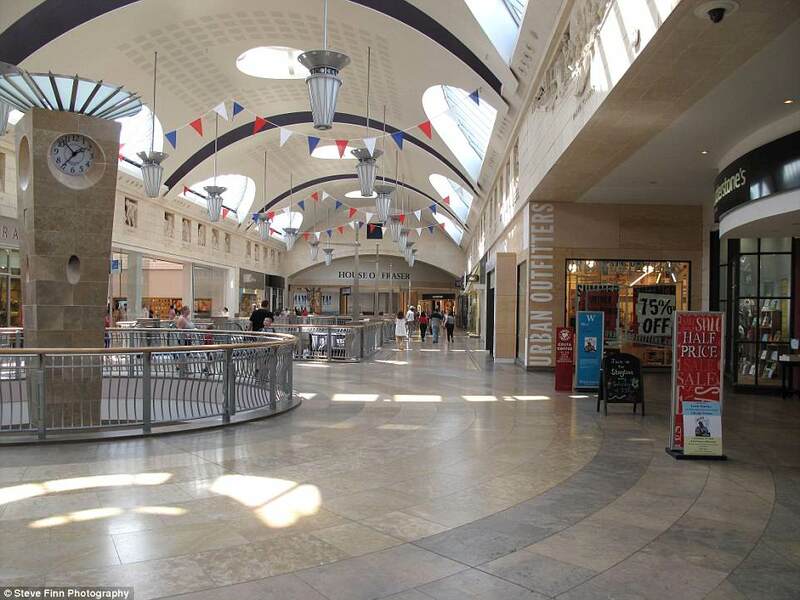 Bluewater in Kent, one of the country’s biggest shopping centres was like a ghost town. 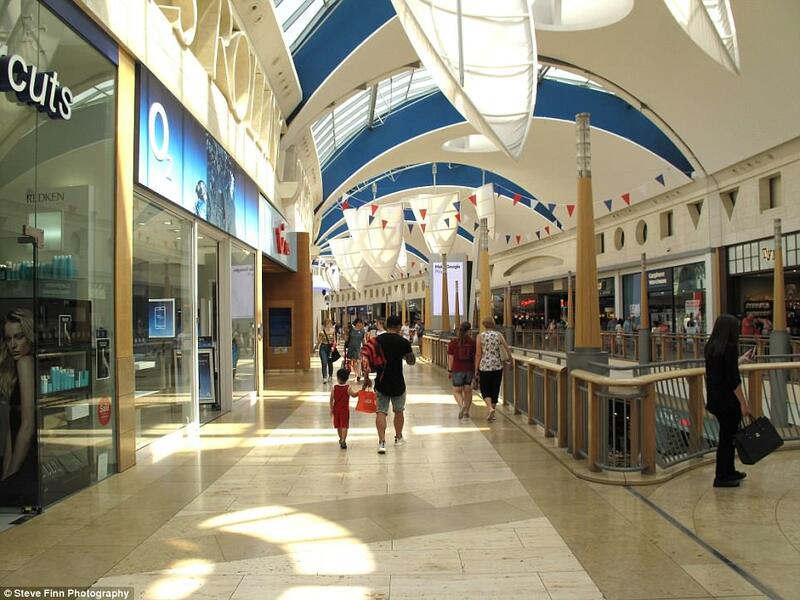 The usually bustling indoor shopping street saw barely anyone frequent the big name high street chains such as Waterstones, House of Fraser and Urban Outfitters. 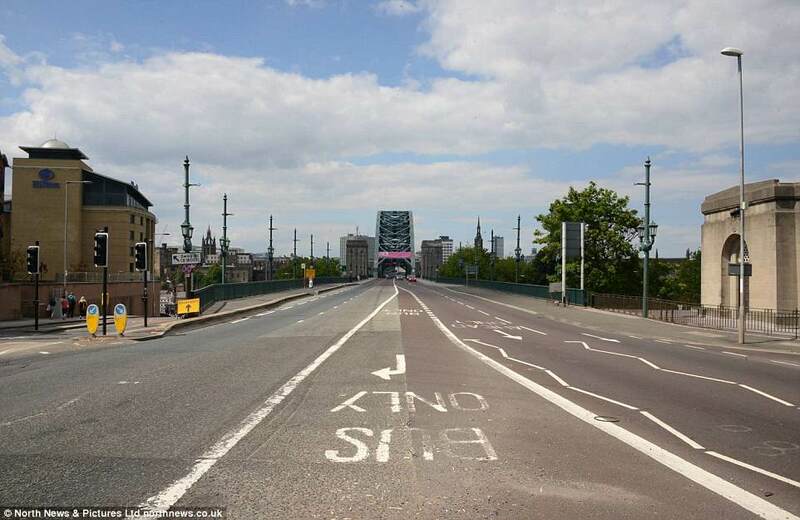 Newcastle’s Tyne Bridge was deserted at 3pm today as the Three Lions kicked off. 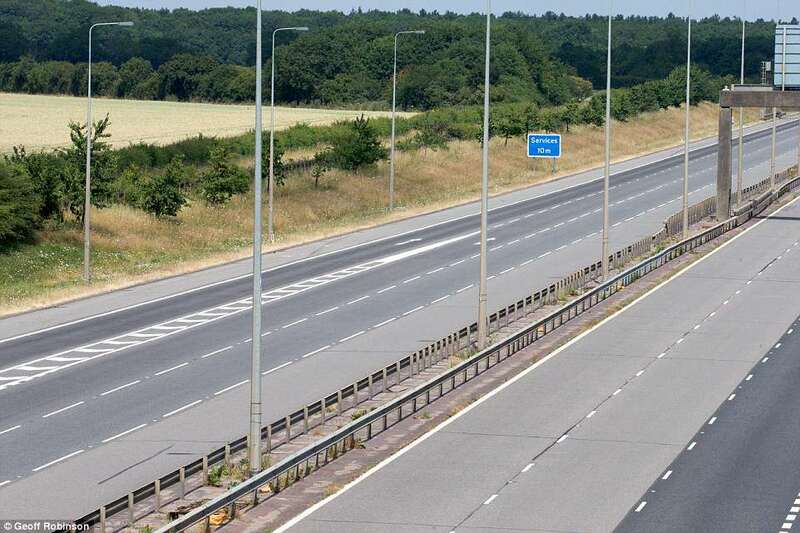 Eerie images show the usually congested road with no cars to be seen. 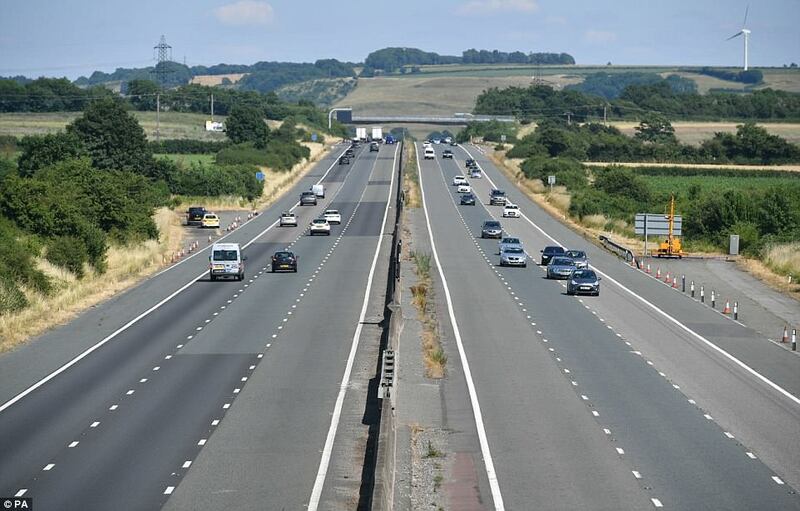 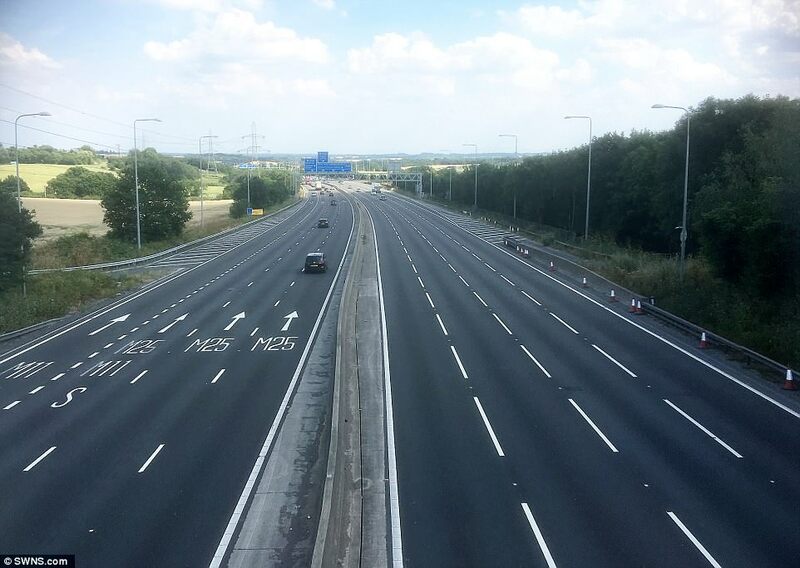 Other pictures show the A1 completely clear for miles as millions of people stayed inside to watch the World Cup. 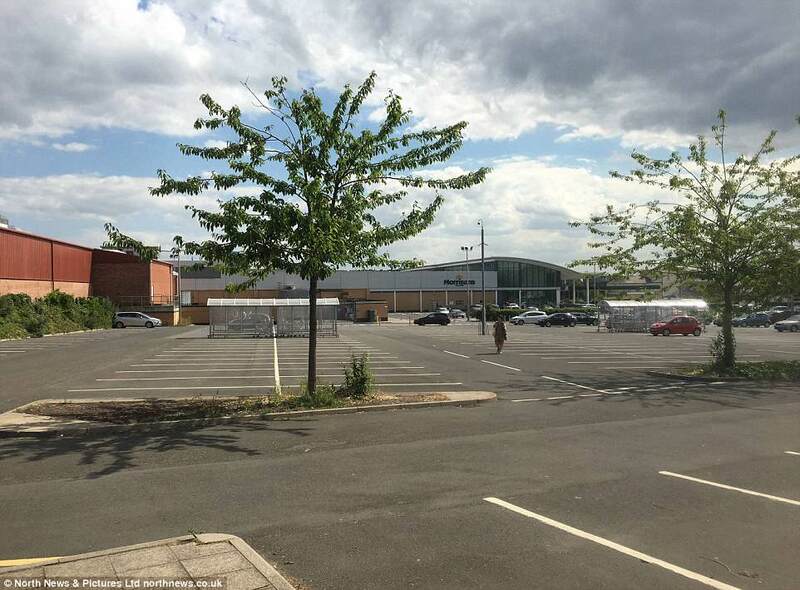 There were empty spaces galore at Morrisons car park in Byker, Newcastle, usually a thriving scene on a Saturday afternoon, but that day it was like a ghost town.